Fitness, health, and wellness are everything. Last night I had a wonderful run. It was one of those runs that almost didn’t happen. I was frustrated and upset and tired and a little bit cranky, and the sun was starting to set. 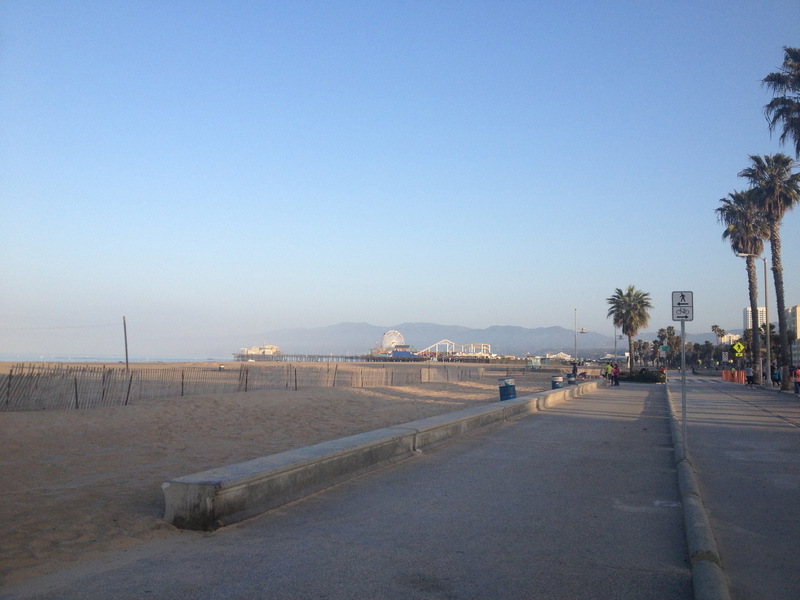 But I was able to convince my mom to drive me down to the beach so I could run along the strand. 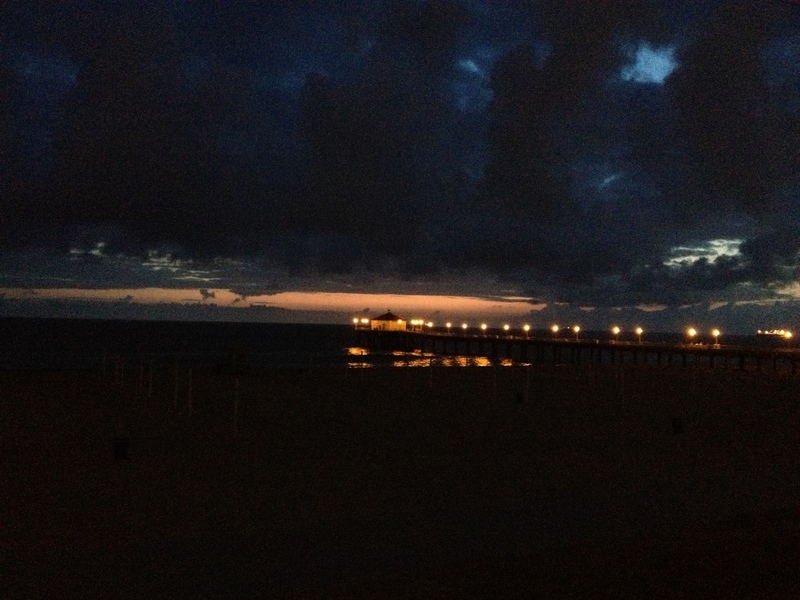 I’ve wanted to run from my pier to the next one down without stopping for a while, but I didn’t realize that last night was going to be that night until I was about halfway there. I realized that I could. And at that point what excuse do I have not to? Besides, who could be uninspired with a view like this? Can you see me and my “cape”? 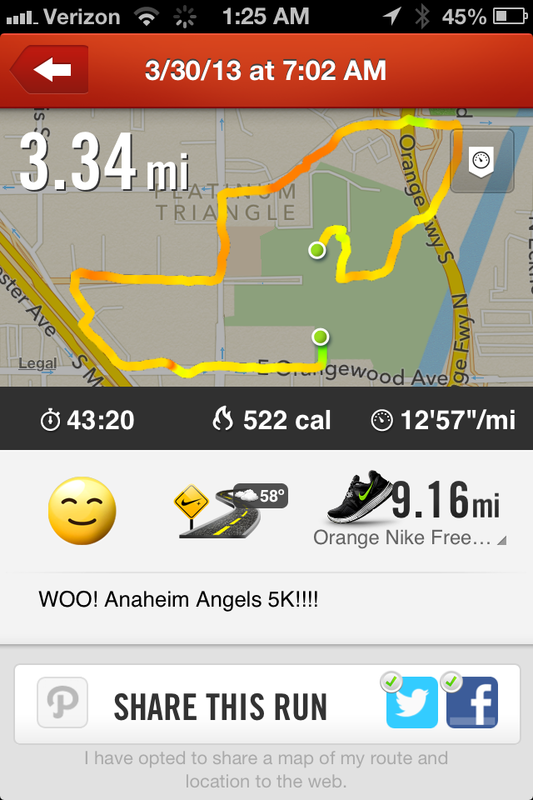 I hit my goal and turned around for a short walk before deciding to pick it back up and go until I hit 5K. I thought for sure I was going to beat my best 5K time, even though that wasn’t my goal when I set out. I came so close! 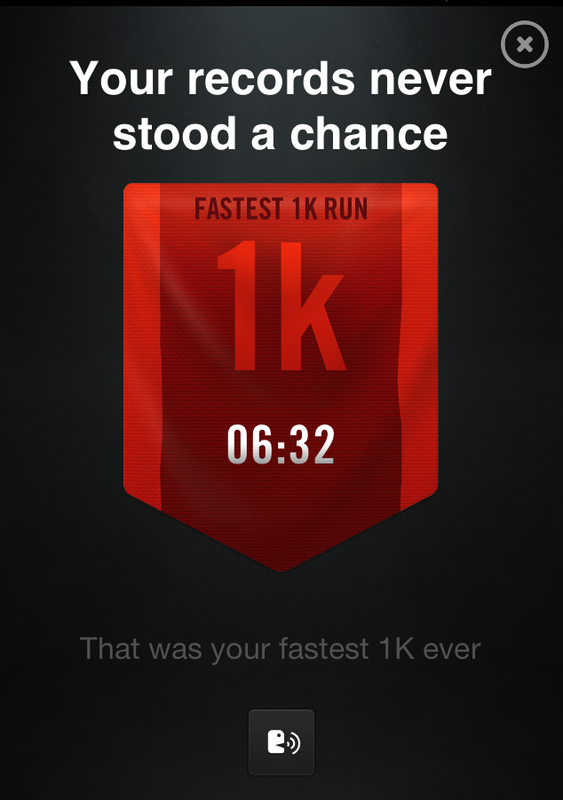 But I finished my run, and my Nike app alerted me that I’d PR’ed my 1K without even really thinking about it! I think that’s my favorite thing about the way that I run right now. I run comfortably and I listen to my body. I just let myself enjoy the feeling and let my mind wander. I’m by no means great. I know a lot of people wouldn’t even consider the pace I’m at “running”. More “jogging” probably. Someday I’ll get to the point where I actually train for races. Someday I’ll actually set out to beat my PR. Someday I’ll be able to feel my pace, or some approximation of it. But for now, I just run. I do the best I can. That’s all there is. I just keep trying to get better in whatever way I can. And there are so many ways that I can improve. If I don’t feel up to running faster, I can run farther. If I can’t keep up a fast enough pace to PR a 5K, I can PR my mile or 1K. 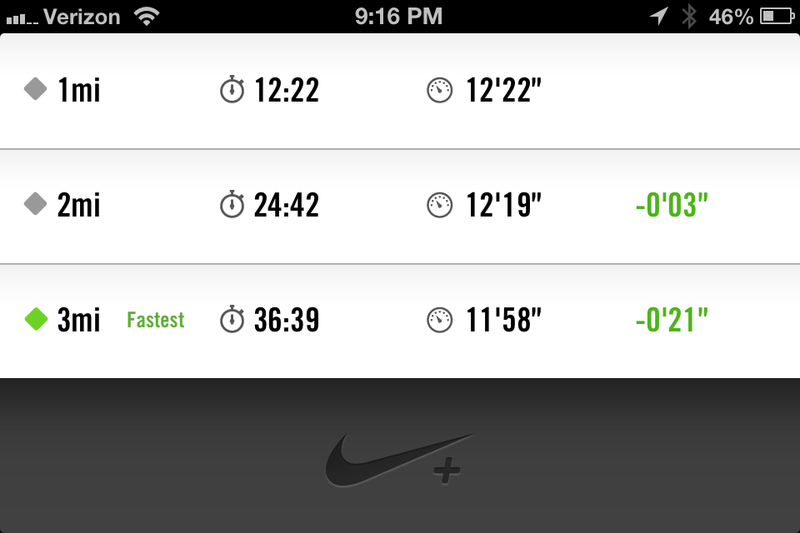 I’m also about 95% sure that last night was the first time my pace got faster with each mile! Growing up I always thought that my friends “lucked” into their bodies, because we did a lot of similar things, often together. In a lot of ways I wasn’t wrong. There are some things that my friends had that I can’t ever get for myself, things like height and proportion/body type. On the other hand, so much of what we did as kids was activity based that I forgot to account for things like the types of athletics we were involved in and account for them as exercise. Even when you know someone well, there are always going to be parts abut them, their lives, and their activity levels that you can’t assume you know. This realization just further reinforced that we shouldn’t compare ourselves to anyone else. We all have different bodies that will take differently to even the same exercise regimes. We all have different histories with diet, health, and activity that all work to make us who we are inside and out. I often romanticize myself, my life, and my body when I was thinner. Particularly when I was around 175 pounds about 3 years ago. What I often forget to take into account was that I was dealing with incredibly high stress levels, was experimenting with smoking, was eating roughly 800 calories per day, getting blood tests every other week to monitor how that was affecting me, taking supplements, and was only fairly active at best (the one time I did P90X I overtaxed my muscles which combined with caffeine and stress to put me in the ER with muscle spasms that I thought at the time was a heart attack). It’s so easy to get caught up in what I looked like without remembering what else was going on with my health. I’m incredibly proud of myself for getting past that mindset and coming to terms with the fact that health is about more than looking good. It’s about feeling good, functioning well, and being able to accomplish my goals. What about you? What do you think about when you work out? What keeps you going when the going gets tough? 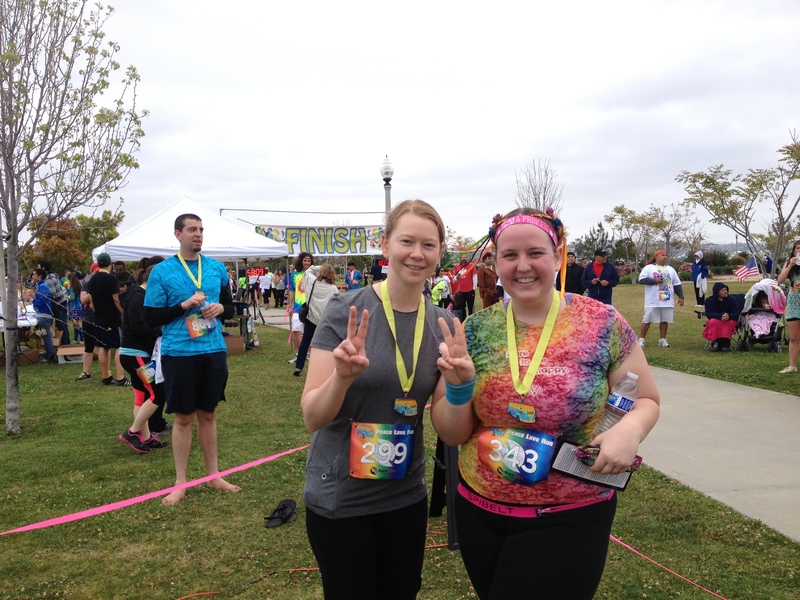 … well technically it was a 5K, 10K, 15K, and half marathon; but I did the 5K and my friend did the 10K, so those are really the only two I’ll be blogging about. 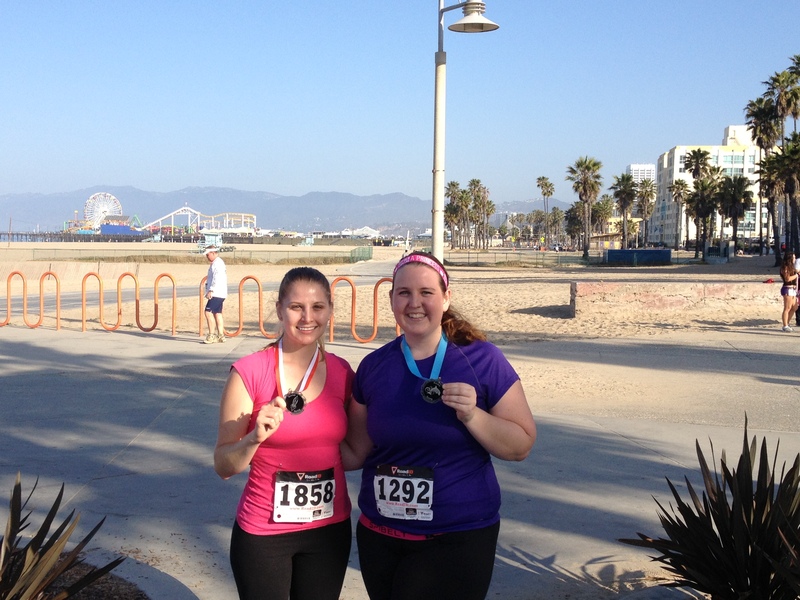 The Beach Fiesta races took place on April 27, 2013, making this race my third and final for the month of April! It was put on by a group called Rocket Racing Productions, who put on a bunch of small races throughout the year. On their website they describe themselves as: “A grass roots effort, helping people achieve their goals by providing a positive conduit for human expression through small, high quality races from triathlons to 5k’s to ultra marathons.” It was the smallest, most laid back race I’ve ever run – but more on that later. 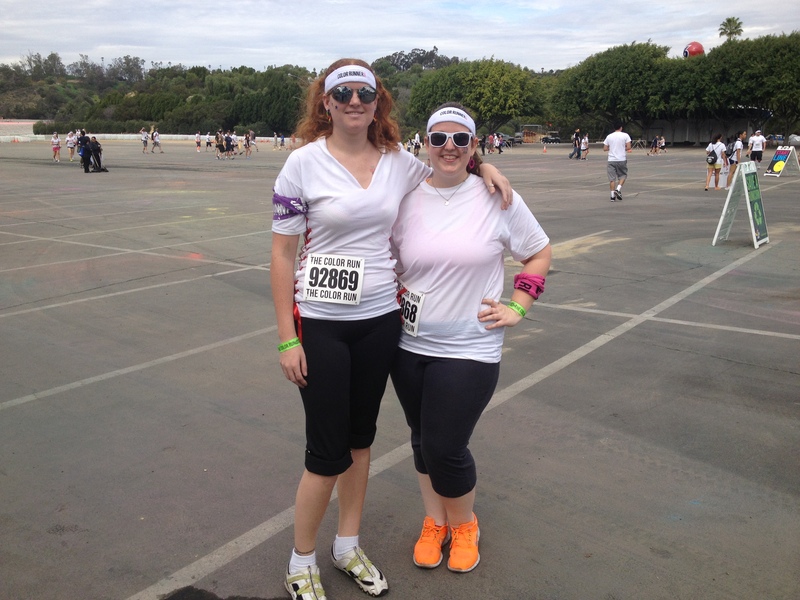 For this race, my friend and I were originally talking about both running the 10K, since neither of us had ever done one; but decided to keep it chill and do the 5K since she’s been so busy with her puppy and work and I’ve been so bogged down with my move. However, you know what they say about plans… I signed up first and by the time my friend when to register, the only race with space left was (surprise, surprise) the 10K! We were both pretty tired from our long days at work on the 26th. (I started at 5:30 am and ended up staying until 3:15 – well into overtime; and she had an even earlier and longer work day than I did!) But we were excited nonetheless and ended up getting there pretty early. 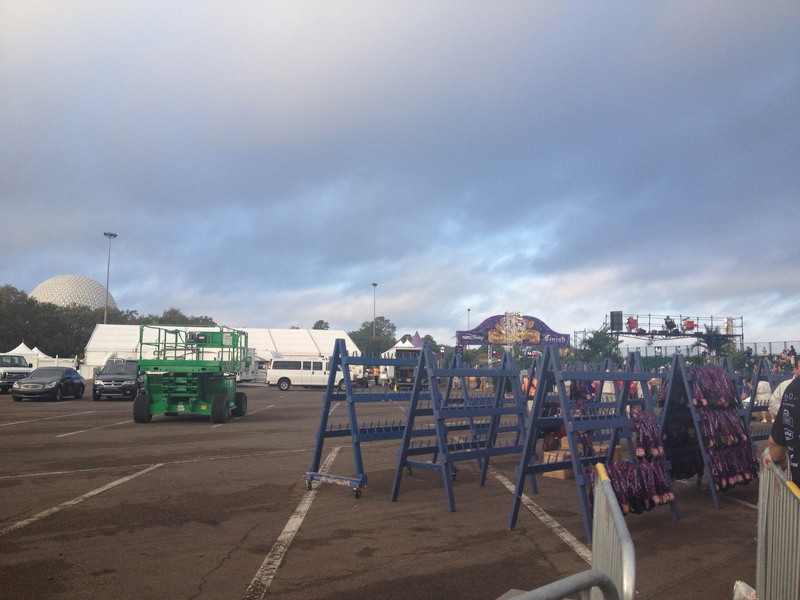 So we checked in, hit the bathrooms, and dropped our stuff off in the car before congregating in the starting area. We basically huddled around the starting line (which was just a large line and the word “START” written in chalk) in a close group. There was only about 100 of us, though it looked like even less to me! Maybe I’m just used to giant crowds, who knows? Look at that view! The starting line was just beyond that yellow pedestrian yield sign on the right. And then, just like that we were off! 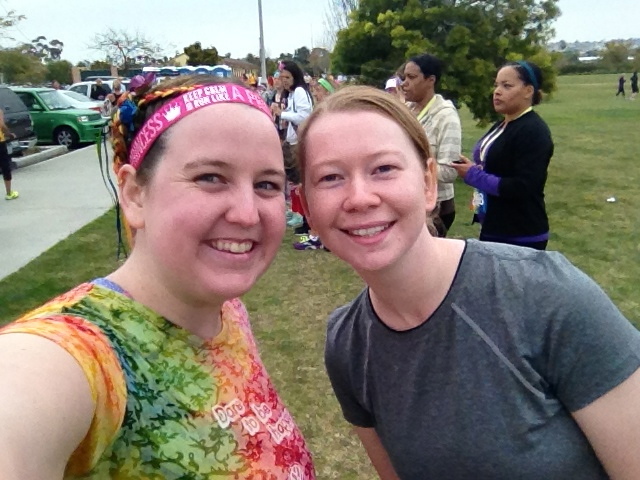 I picked up the pace again just in time to pass my friend on her way back to the start! (We high-fived and everything. It was adorable.) Seeing her gave me just the extra kick I needed to make it to the halfway mark! The race took place on an open course, which meant that along the way we passed tons of other runners, walkers, running groups, bicyclists, and dog walkers. It was fun seeing all of the different kinds people out and about doing their morning activity! It also kept me relaxed about the race; which was nice since sometimes I get so caught up in doing well and comparing myself to the runners around me that I can get a little stressed and forget to enjoy myself as much a I should. The view from the halfway marker. Unfortunately, here’s where I had a bit of a hiccup in my tracking. I’m not quite sure why (I’m sure there’s some setting I can tweak to fix it) but for whatever reason my running apps pause themselves when I go to take a picture during a run. I’m sure this is because the designers figure you’re standing still to take the photo, and would automatically want it to pause, but since I always forget to resume them I’d much rather take the few extra seconds. I lost about a quarter mile of my progress before I realized that they were still paused! The way back was wonderful, despite the rising sun and temperature. I allowed myself to walk if I needed to, but made sure to take advantage of the shade as opportunities to run. 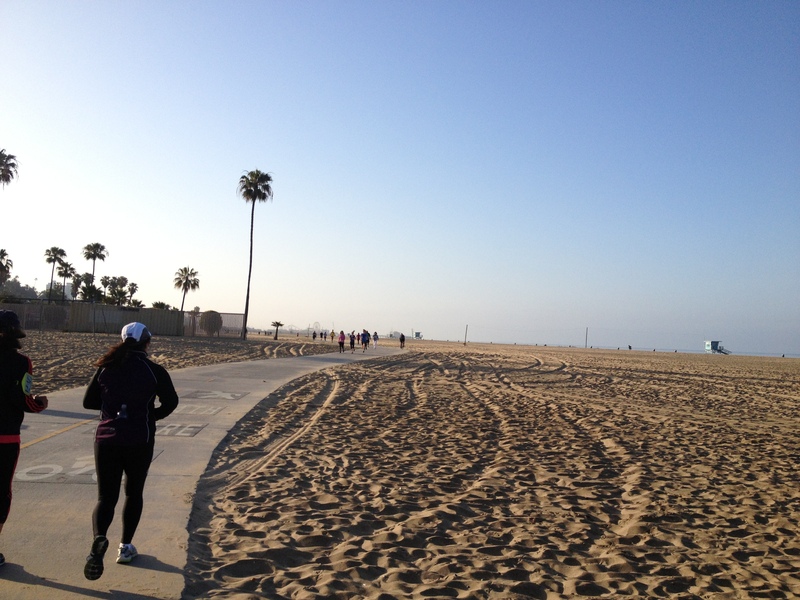 There’s just something about running at the beach I love. It’s one of the things I’m going to miss most about California. (Though I won’t miss the heat, even though we were done before 8 am, it got pretty warm!) Not to mention that I got to look forward to passing my friend again. This time we fist-bumped and I noticed she’d made a running buddy. Here’s a photo the organizers took of them at the turnaround. When I finally got to the home stretch, I could see that the ground was divided along the center – runners turning around at the hydration table on the right, finishers on the left. I swung into the proper lane, which took me right past the photographer, who urged me to smile. What I usually look like when I run. Not so pretty. I paused my run long enough to grab some water and my medal, and then kept going to burn off that extra 0.25 miles to get me to 5K status on my running apps. When I finished a voice congratulated me through my earbuds on achieving a new fastest mile time! I’d shaved off 8 seconds from my previous best time, bringing me down to 11:24! 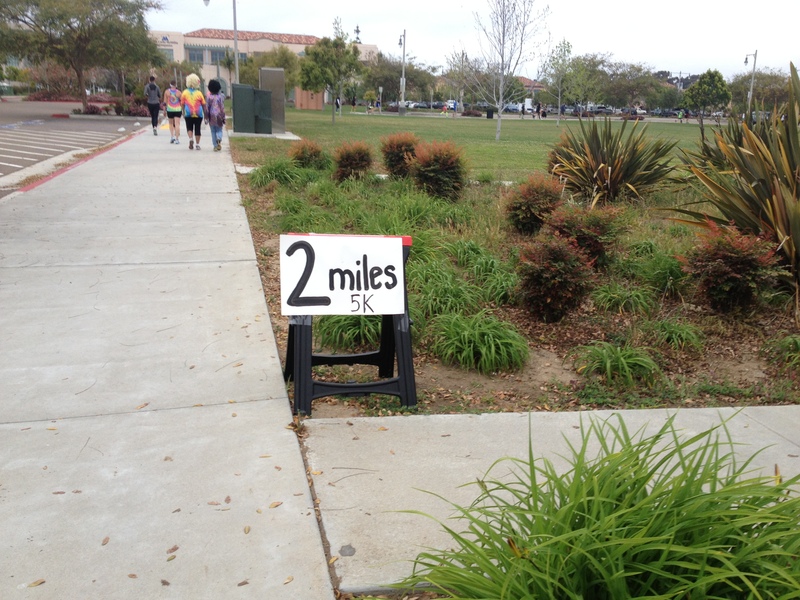 Less than 2.5 minutes away from this year’s goal of a 9 minute or under mile! Once I’d finished “earning” my 5K I had just enough time to snap a post-race selfie, and walk back to catch my friend finishing! I had to stare into the sun to get the pier in the background. Worth it. She was exhausted and pale (I thought she’d put sunscreen on, that’s how white her face was) but she’d dominated it! 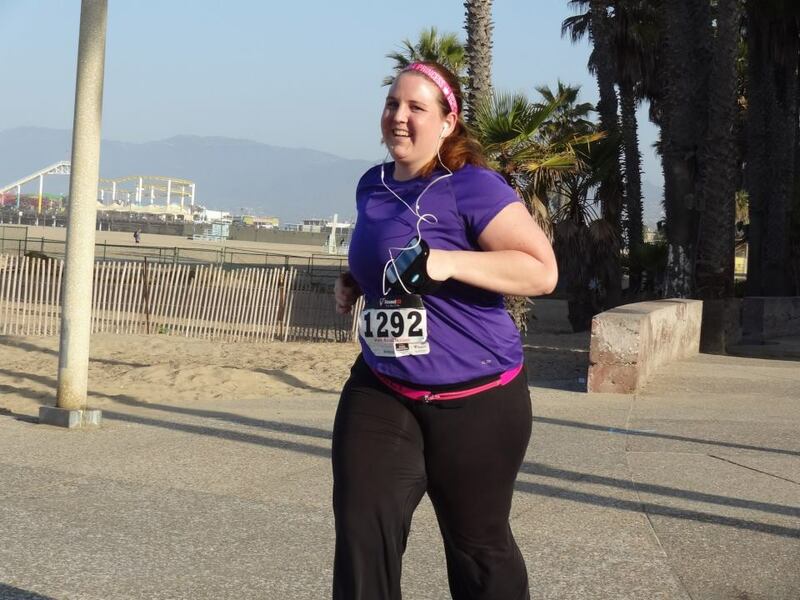 Her goal was to come in under an hour, and she made it somewhere around 53:00! Not bad for a first 10K (or so I’m told, haha). 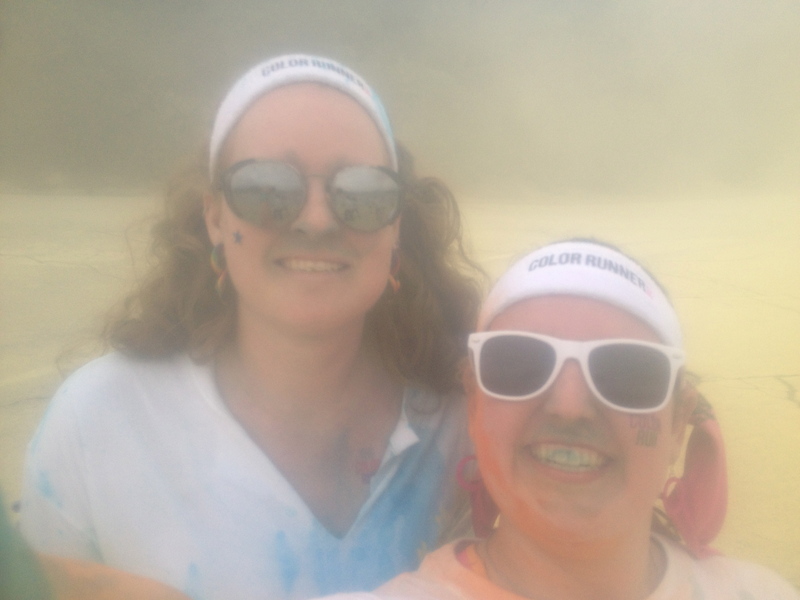 It turns out she’d started chatting with her new friend right before the turnaround and they were both running their first 10K! So since they’d been pacing kind of similarly for the first 5, they decided to run out the second leg together. 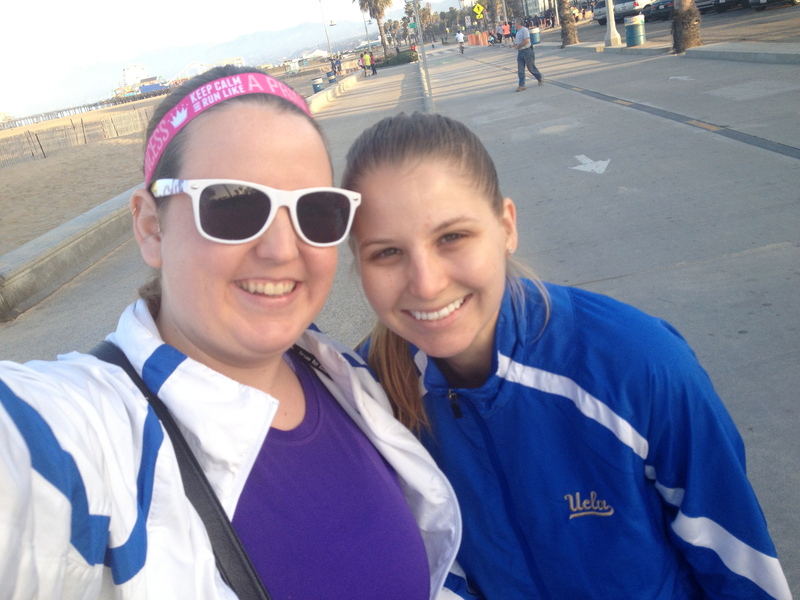 My friend told me that there were times when she wanted to stop, and her new running buddy wouldn’t let her, and that she returned the favor along the route! Definitely something I hope to be able to do with people someday! In the end she managed to do the whole thing without stopping to walk at all! My hero! When we went to ask for her time, the photographer asked if we wanted a picture together! We stopped to grab some hydration (some kind of electrolyte drink and water) and food (Quaker blueberry bars and bananas) and she picked up her medal before saying goodbye to her running buddy. We troubled a nice group of people who’d also done the 5K to take a picture for us with my phone, since I wasn’t sure how the official photos would be posted and wanted my own. 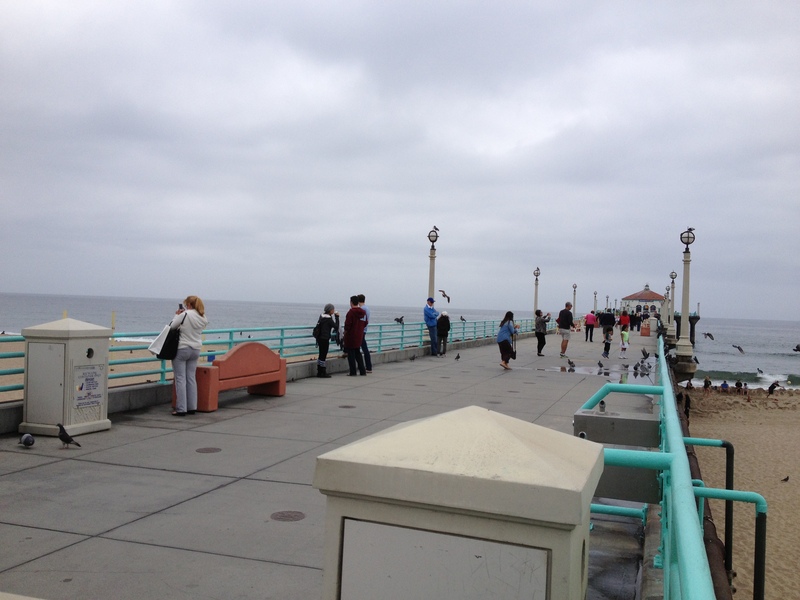 They even made sure to get the pier in the background for me! We were both so beat that we ended up just chatting in the car for a bit afterwards instead of hitting the road right away. Another reason to be grateful for the smaller scene, no traffic jams to worry about getting caught in! I came home to find something really exciting waiting for me! Two medals in one day? Fabulous! I also checked the posted results and found out that I’d finished in 40:23. Not my best time, but still not terrible. 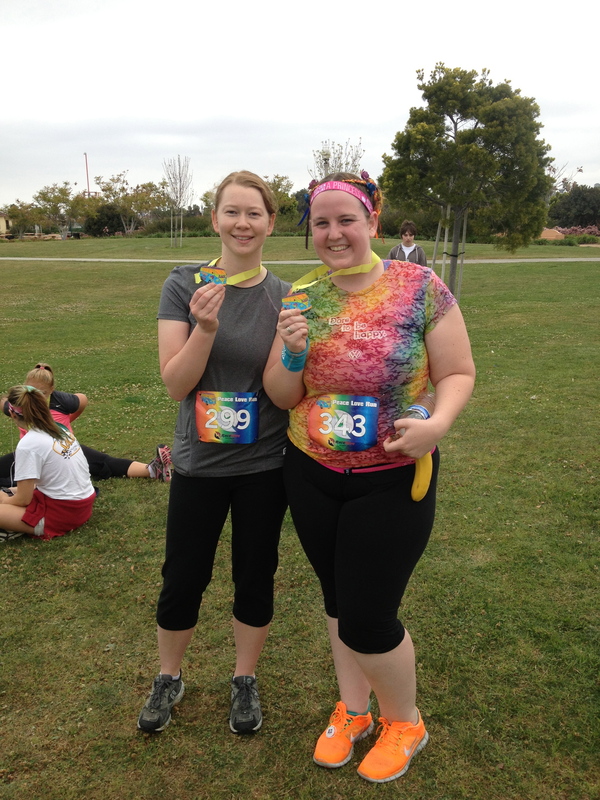 I also placed 39/53 for the 5K! Again, not terrible. I’ll take it! 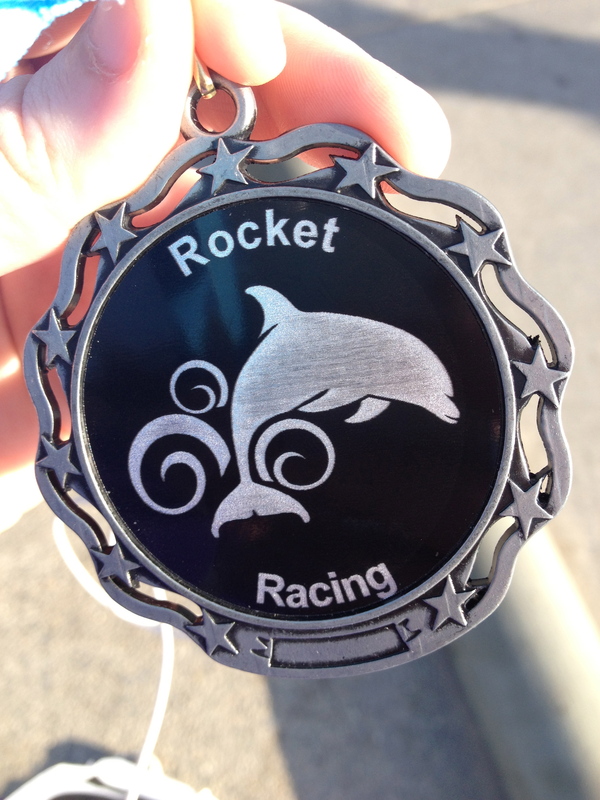 Interested in learning more about Rocket Racing or the Beach Fiesta 5K/10K/15K/Half Marathon? Check out their website! 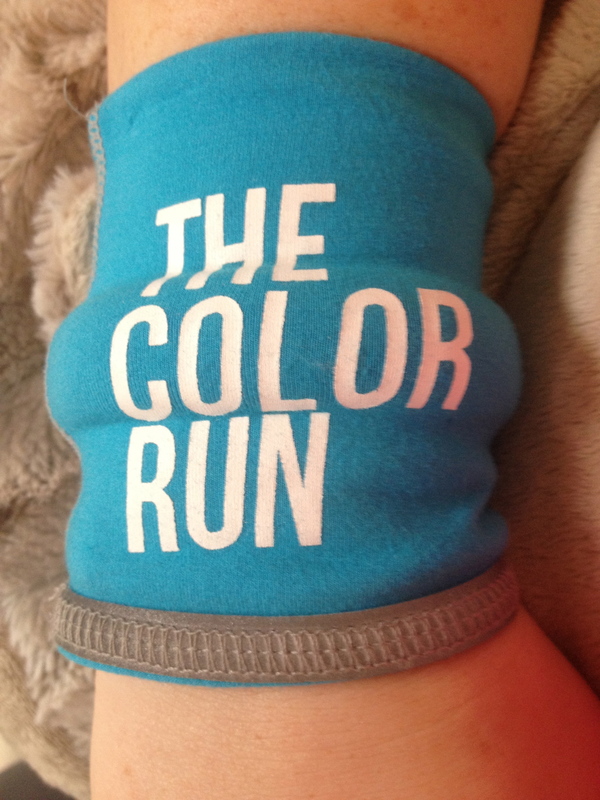 They’re also sponsoring a Virtual 5K which I’ll be doing as my May race! Sign up here! 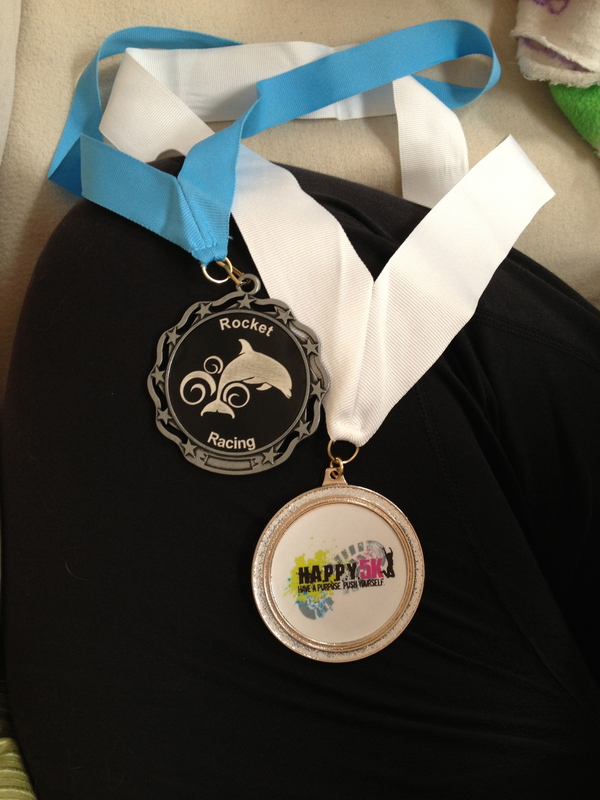 I ran the Peace Love Run on April 14, 2013, the day after I ran the Happy 5K. If you already saw my Race Recap for it then you know that these two races took place wedged inside of one of my best friends’s birthday weekend celebrations. The day before I ran the Peace Love Run I went to the Renaissance Faire. It was fabulous and I highly recommend it if you enjoy whimsy and costumes. A friend loaned me clothes so I could dress up! 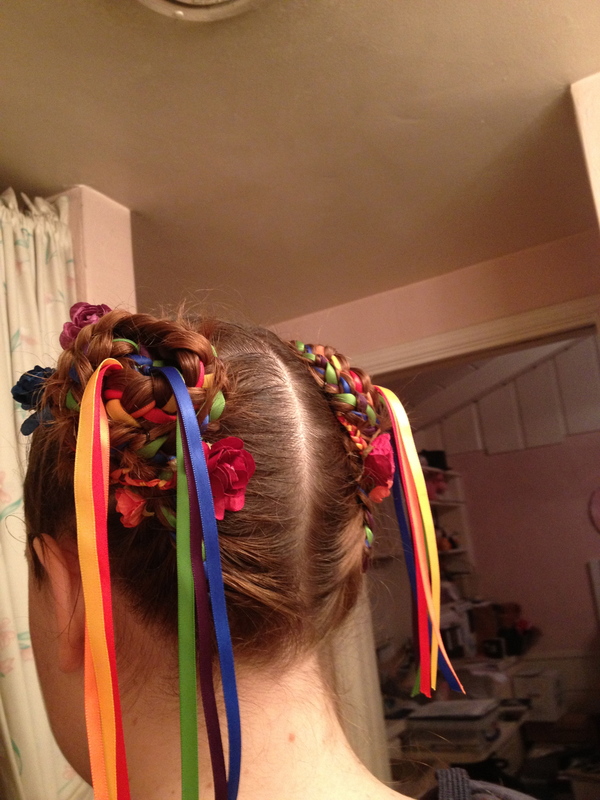 While we were at the Ren Faire, I decided to get my hair braided, and since the 5K was 60s themed, I decided to go for some bright colored swirls! After getting home, I immediately hopped in the car and headed down to San Diego to stay with my friend who was running the race with me. It was so awesome to get to see her again, because it’s been a while since I’ve we’ve hung out and she’s always wonderful to be around. I also got to meet her two cats, who are precious. 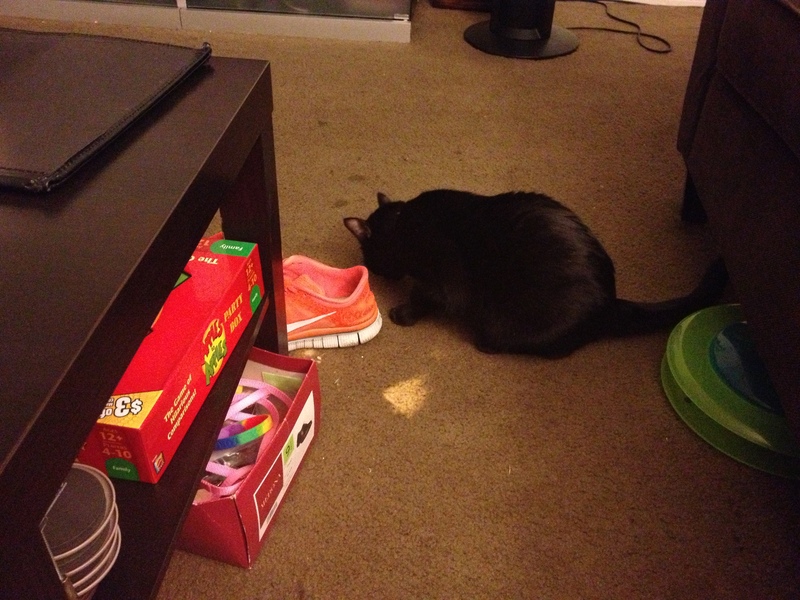 One of them was obsessed with my shoes! We talked for a while, but fairly soon it was time to get some sleep for the race! The next morning she made me an AWESOME green smoothie, which was amazing! 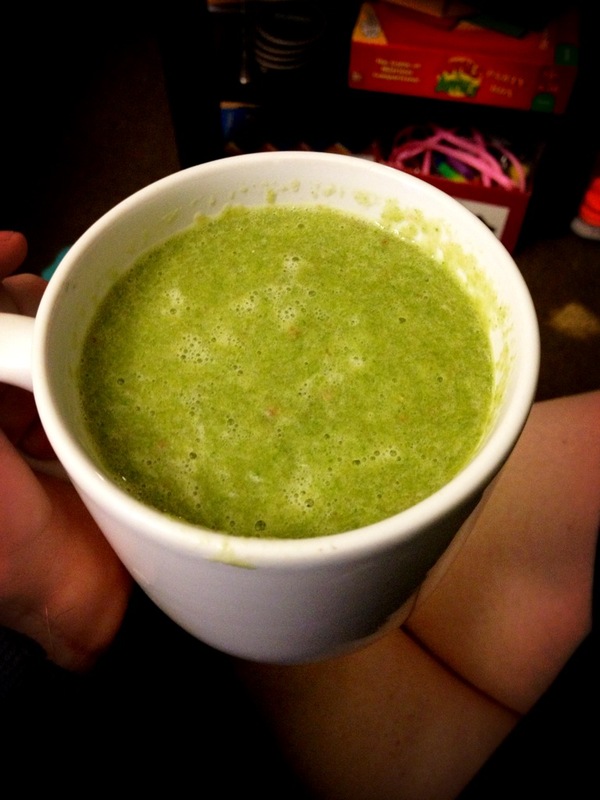 Seriously, words canot express how much I love green smoothies. 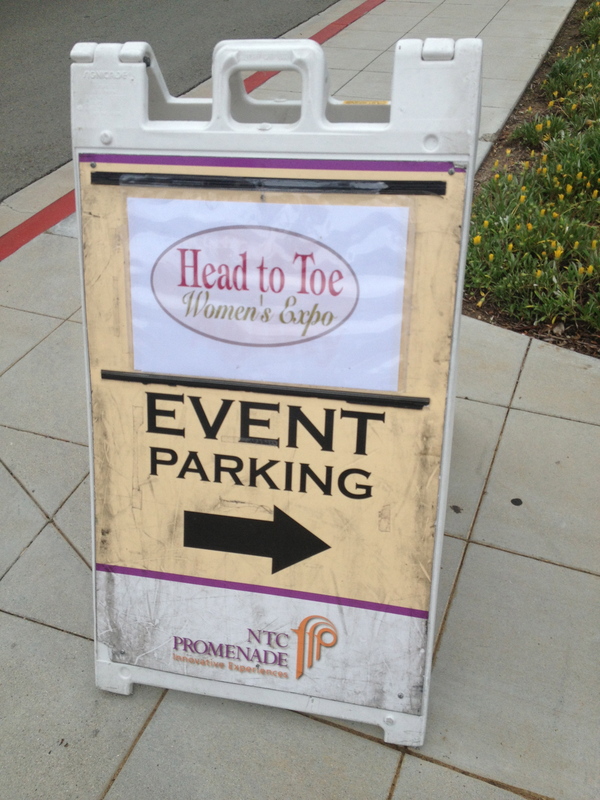 The (relatively small) sandwich board labeling the parking area once we found it. The actual registration area was pretty low key compared to the races I’d done so far, and getting our bibs and everything went fast enough that we were able to hit up the bathrooms despite the lines. 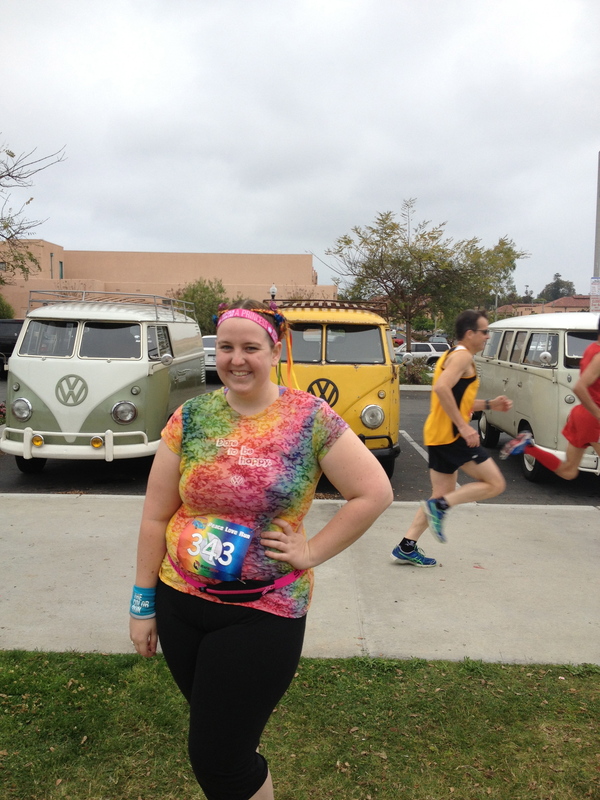 We forewent the warm up in favor of staying warm in the car for the additional half hour between when we finished and when the race began.The 10K started 10 minutes before the 5, and we used that opportunity to snap a photo of me in front of some of the festive VW Buses that were parked nearby. So cool! 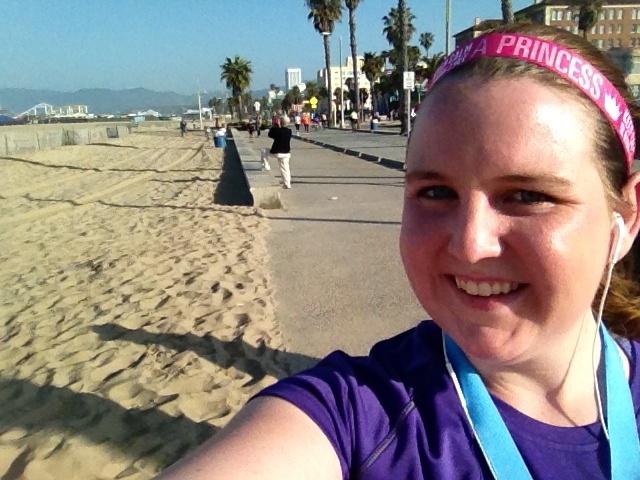 Also, check out those legit runners behind me! Someday I’ll be more like them. And with that, we were off! 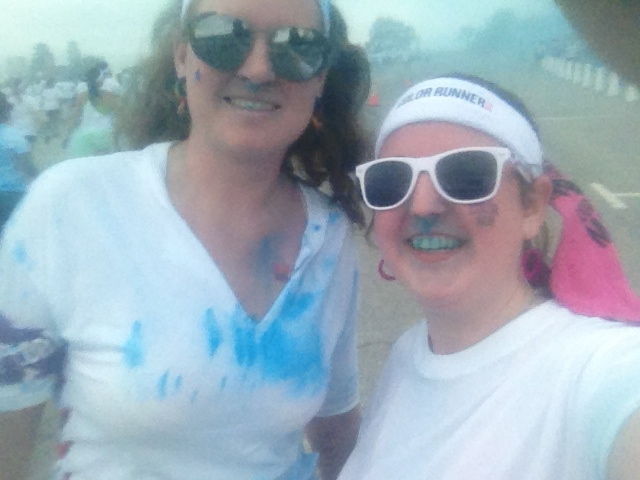 This was my first race where I was running with someone the entire time and we chatted. Usually I run solo. Not necessarily because I want to (though I do tend to enjoy the opportunity to zone out or be alone with my thoughts and my music depending on how I feel) but because my dad is still too injured to run with me and I’m too shy to get involved in the local run club yet. Being able to talk together was a nice way to distract myself from the actual running and definitely something I’d like to start doing in the future once I develop a bit more stamina. The views along the course were pretty awesome, and thank goodness we were running because the weather stayed pretty chilly the entire time. 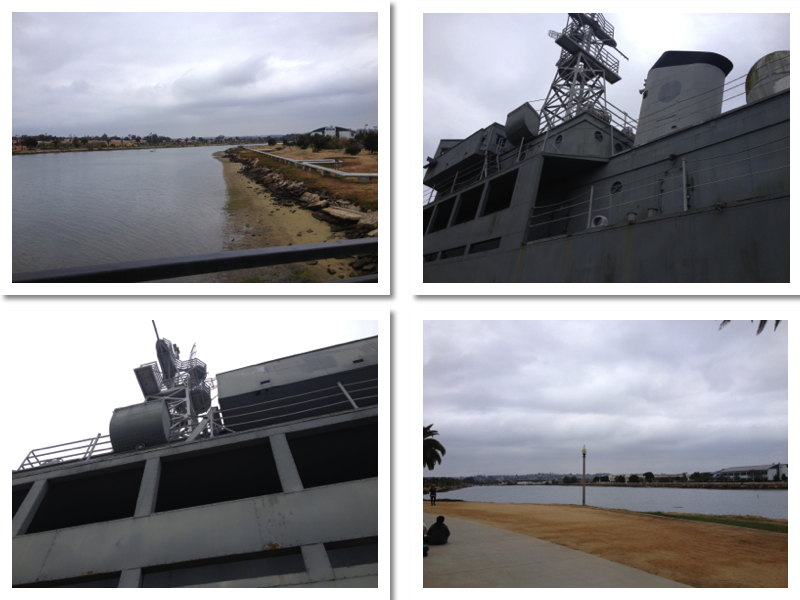 Some really cool views and a giant ship! Because it was the inaugural race most of the signs and things were fairly simple, but I liked them nonetheless. 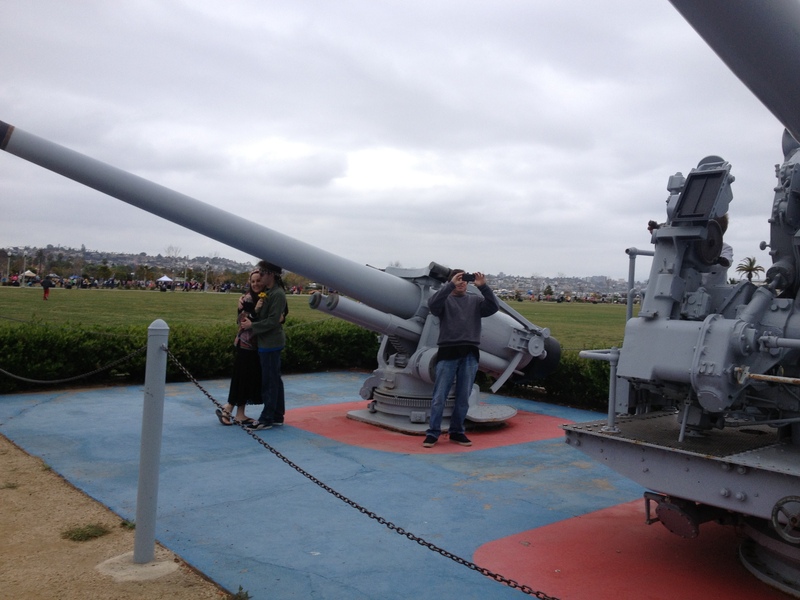 At one point we passed some Naval artillery guns, and a few people posed with them and I thought it was interesting to see the old-fashioned guns and people dressed as hippies posing together. Just seemed to fit the theme well to me. 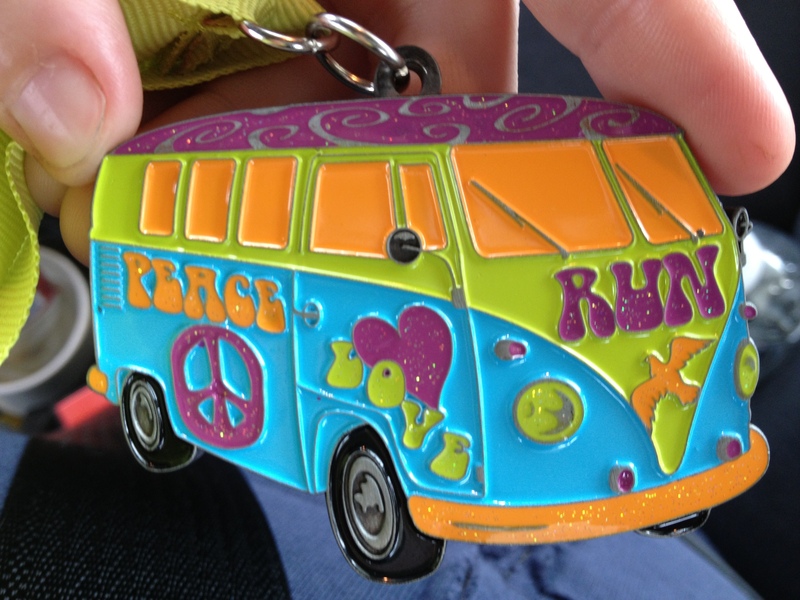 After the race ended, we got a few pictures taken with our cool VW Bus medals! 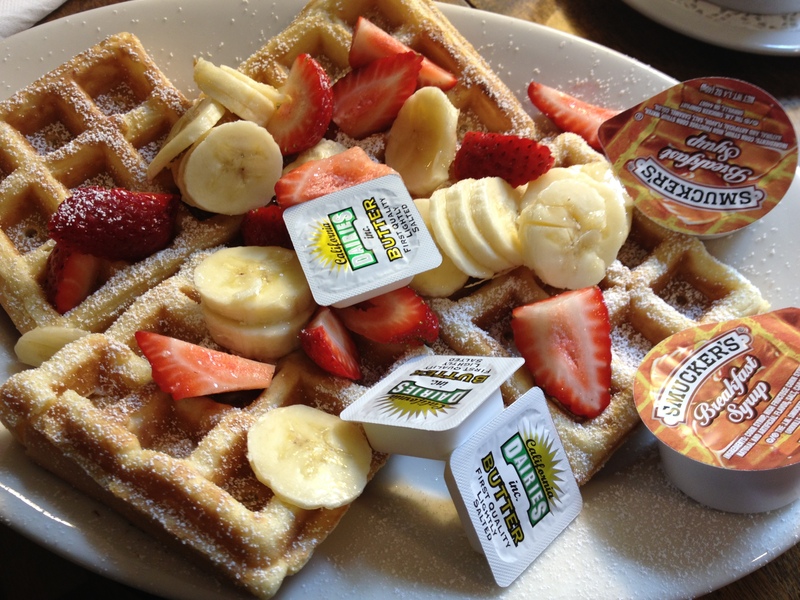 Of course, I was only able to eat about 1.5 waffles and the fruit. What a blast! 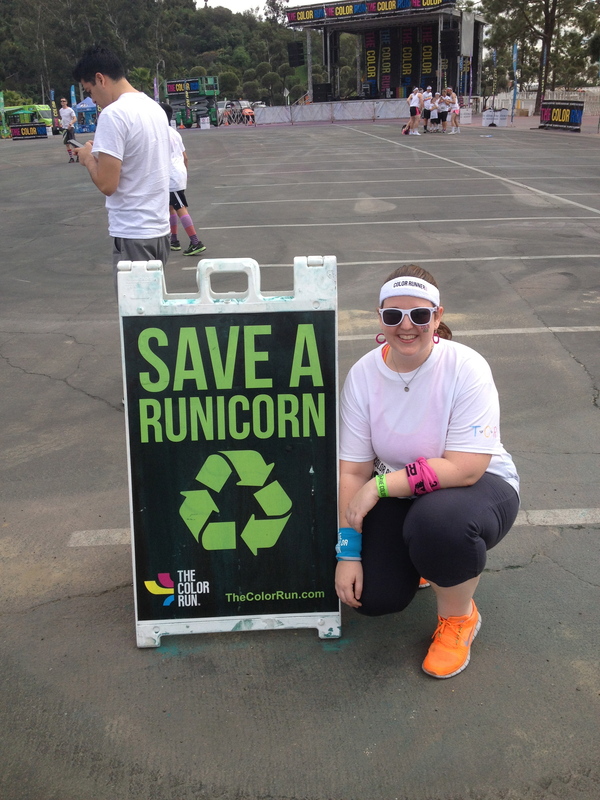 Theme/costume runs are my favorite, and this one was no exception! Plus, seriously, how cool is this medal? 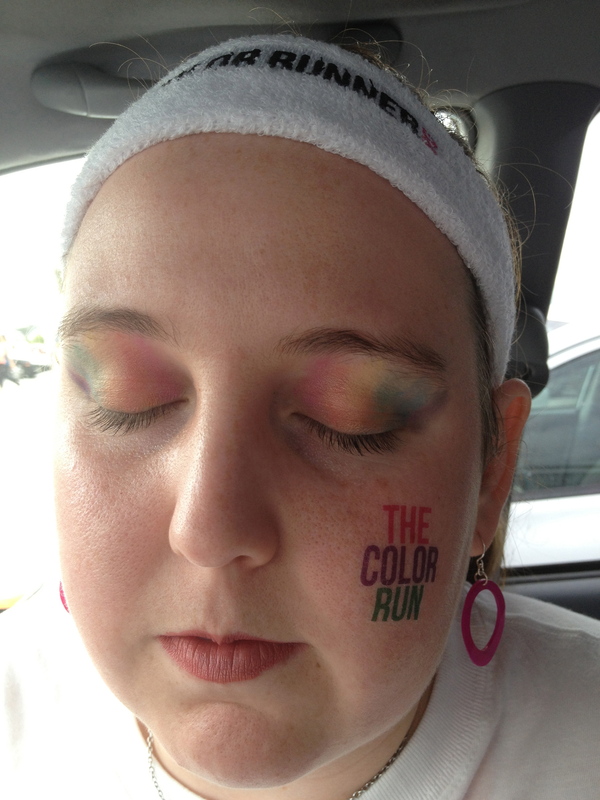 Interested in learning more about the Peace Love Run? Check out their website! 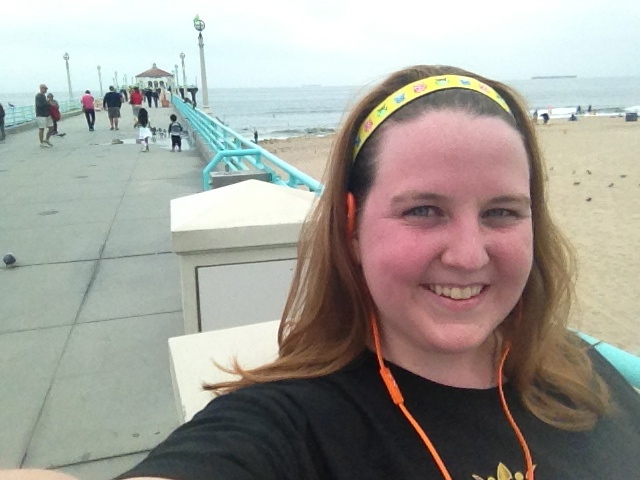 I learned about the Happy 5K from Erin just in the nick of time! Four days before it ended, yikes! 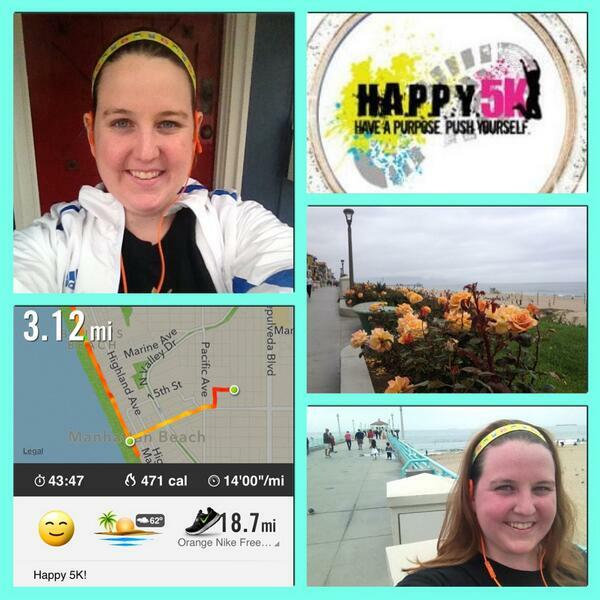 (Check out Erin’s post about her Happy 5K here.) 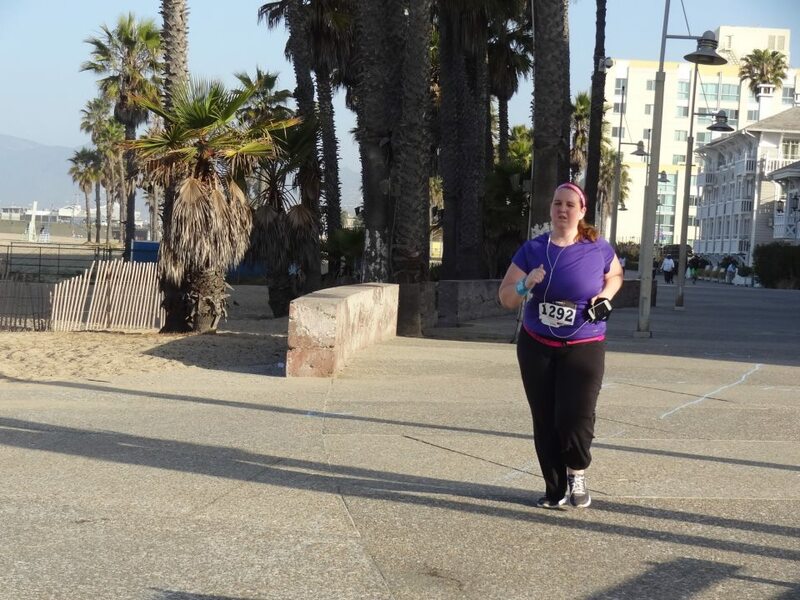 I’m so glad she posted about it, because I’m always looking for more races to add to my arsenal and honestly, I thought that it was not only a wonderful idea, but was pleased as punch to be running to help support the Leukemia and Lymphoma Society. A cool idea for an good cause. My favorite! 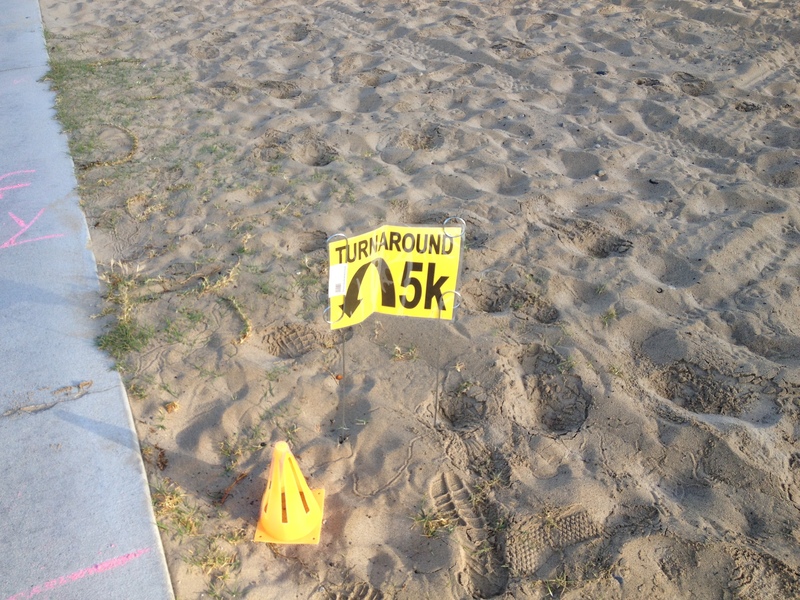 Anyway, the basic premise of the Happy 5K is that it’s a virtual 5K. It was created by Amanda Kelly (more about Amanda here) and Laura Ingalls (visit Laura’s blog here). 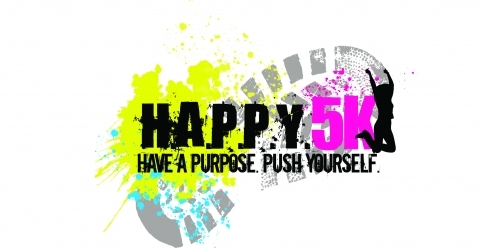 Participants were able to sign up online, and do a 5K where or whenever they pleased (as long as it was before April 15th) and then tweet, facebook, or instagram about it using the tag #Happy5K, and tagging appropriately based on the platform. 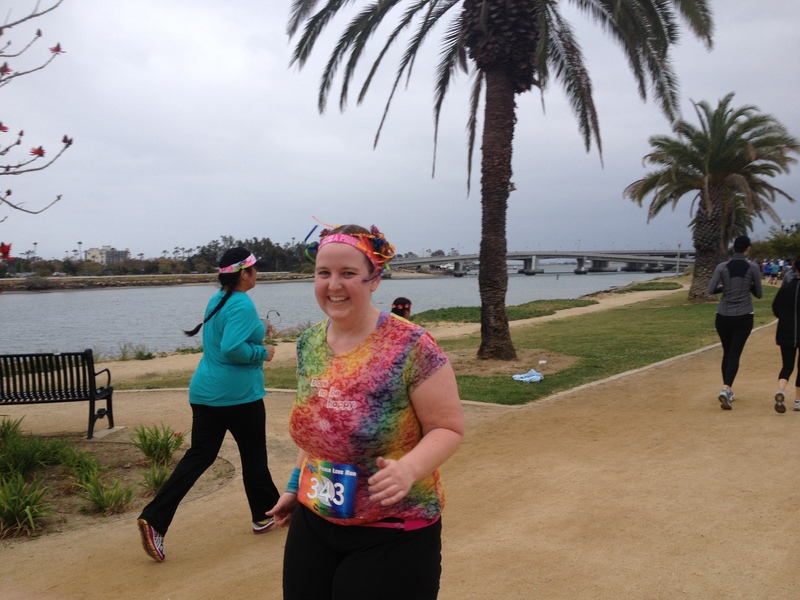 Because of the time crunch, my Happy 5K ended up being a little strange… It landed on the weekend of my good friend’s birthday weekend celebration and of the Peace Love Run! So it ended up wedged between a night out at a karaoke bar and a trip to the Renaissance Faire. 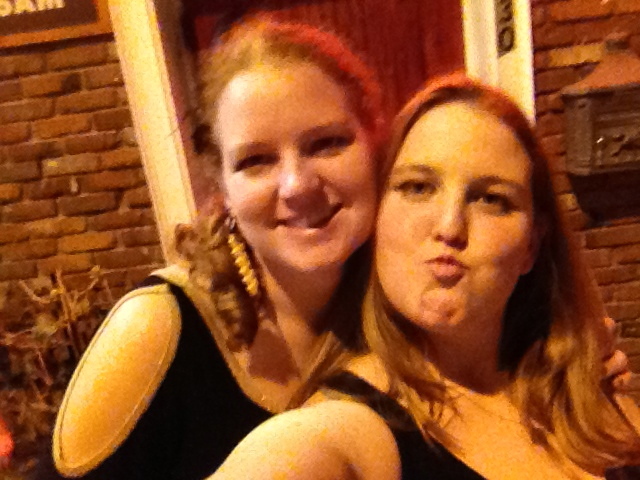 I thought it’d be funny to take an obligatory duck-face selfie. This is why I don’t drink. Needless to say I woke up after partying at the karaoke bar and seriously didn’t want to get out of bed. 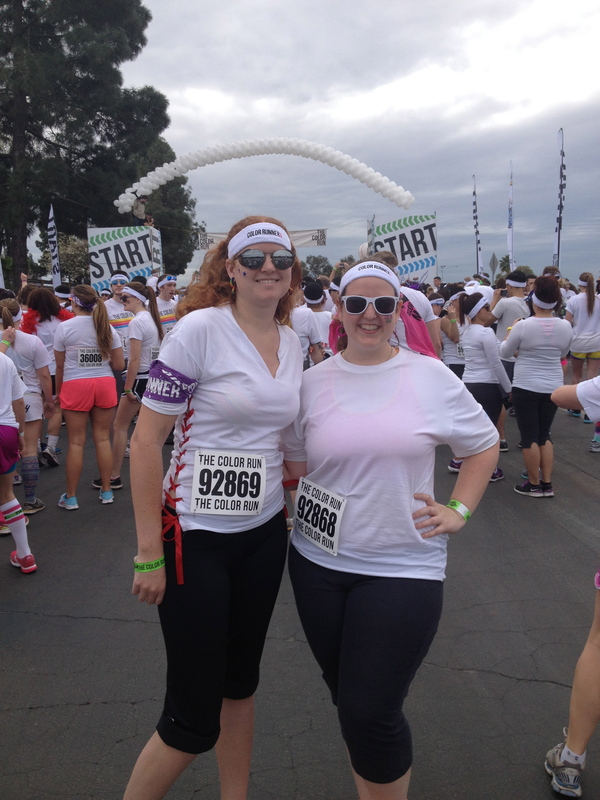 If it hadn’t been for this 5K, I would have made excuses and let myself stay in bed all morning. 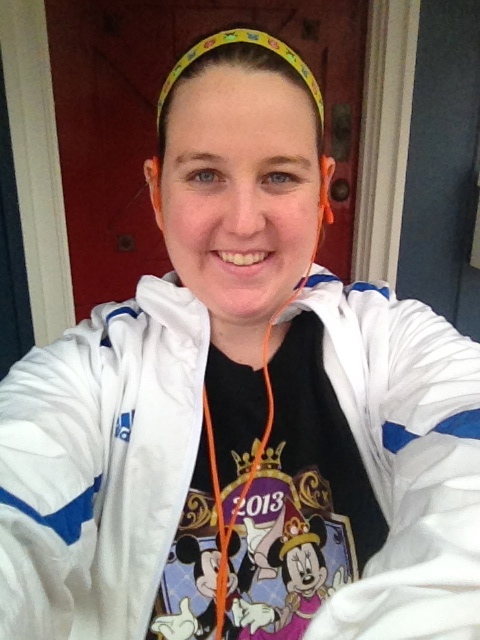 Instead, I forced myself up and decked myself out in some of my favorite past 5K stuff to help psych myself up! 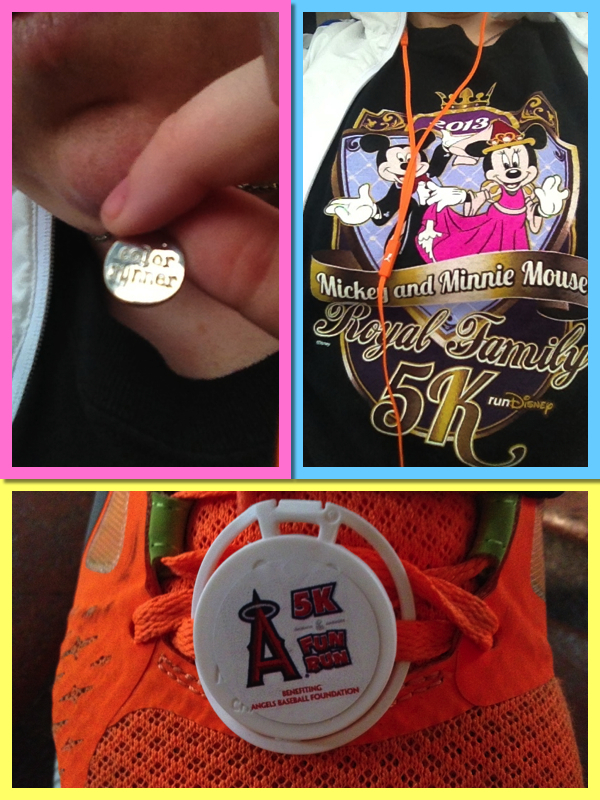 My Color Runner necklace, my Royal Family 5K tee, and my Angel’s 5K shoe tag. With my gear on and as ready as I was going to be, it was time to get running! 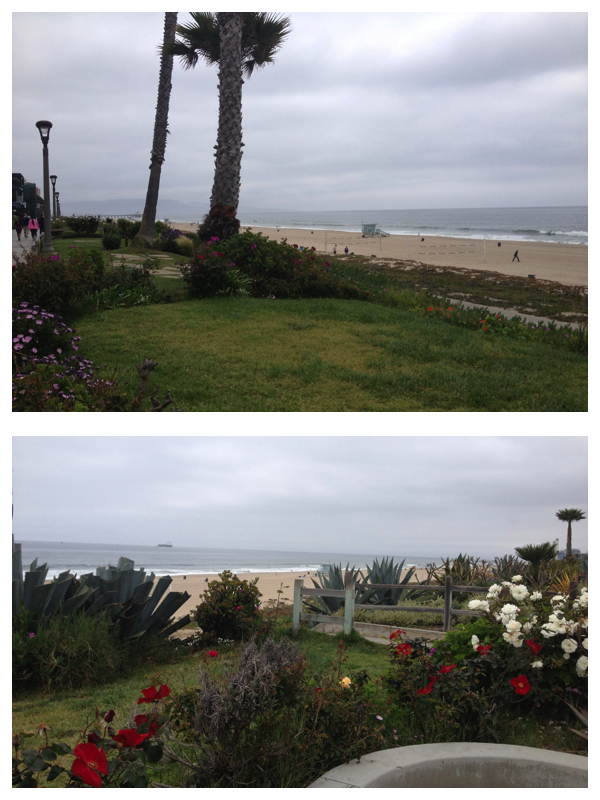 The weather was a little gloomy, but I’d already kind of planned out a path that I wanted to follow which took me down by the beach for some awesome views regardless! The awesome view from my turnaround point! 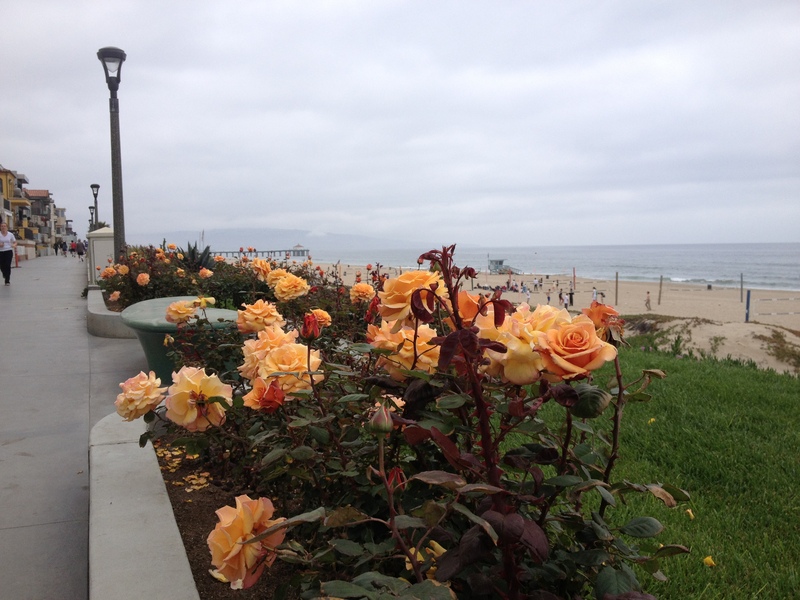 These orange roses brought an extra little smile to my face since orange is my favorite color! 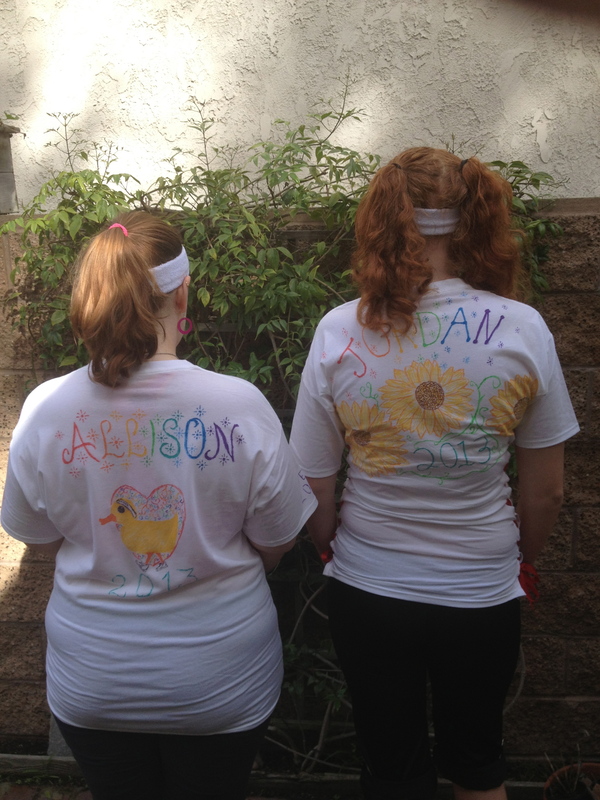 This 5K was hard. 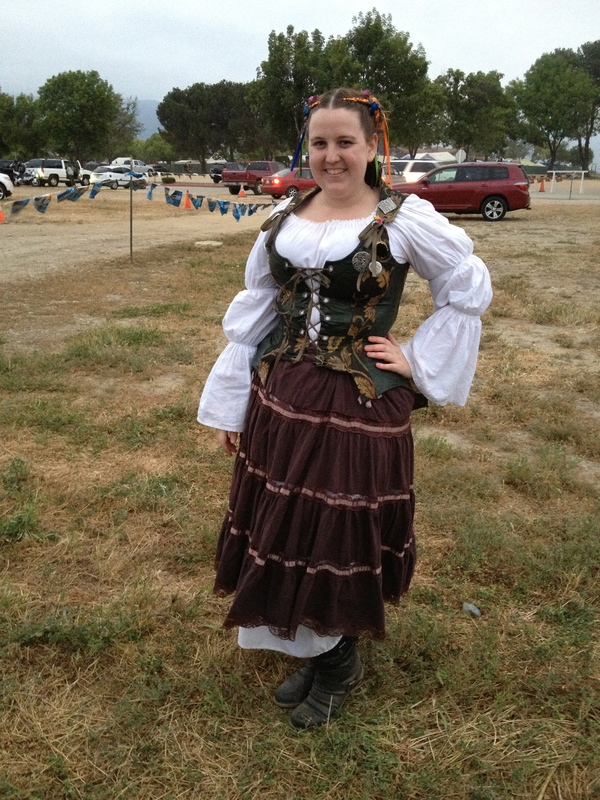 I was tired and not feeling 100%, and knew that as soon as I was done I was off to a day on my feet at the Ren Faire, but I reminded myself why I was running it and what it was about and couldn’t help but feel happy in spite of all of it. 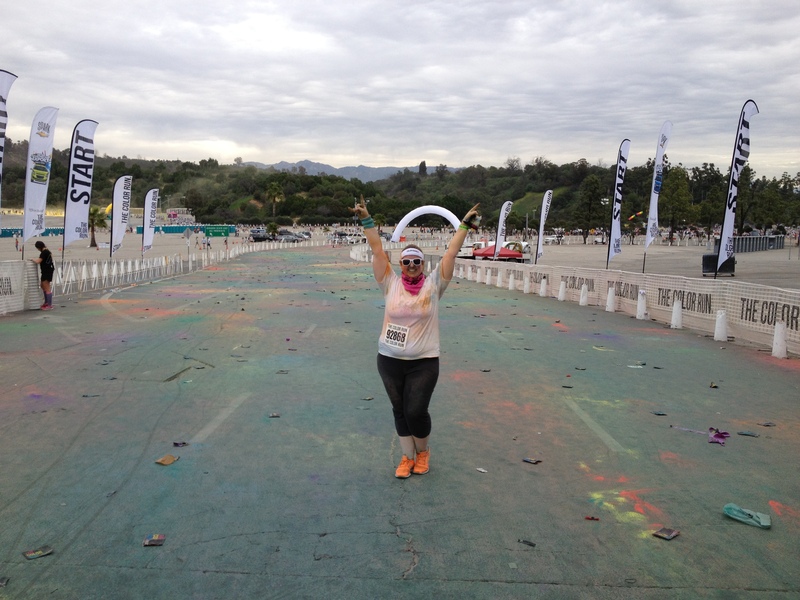 A pretty awesome finish line! Once I finished I threw some of the pictures together (as I’m sure you guys have noticed I love doing, haha) and tweeted about it, before running off to shower and get ready for the Ren Faire. Can you tell I love collaging? 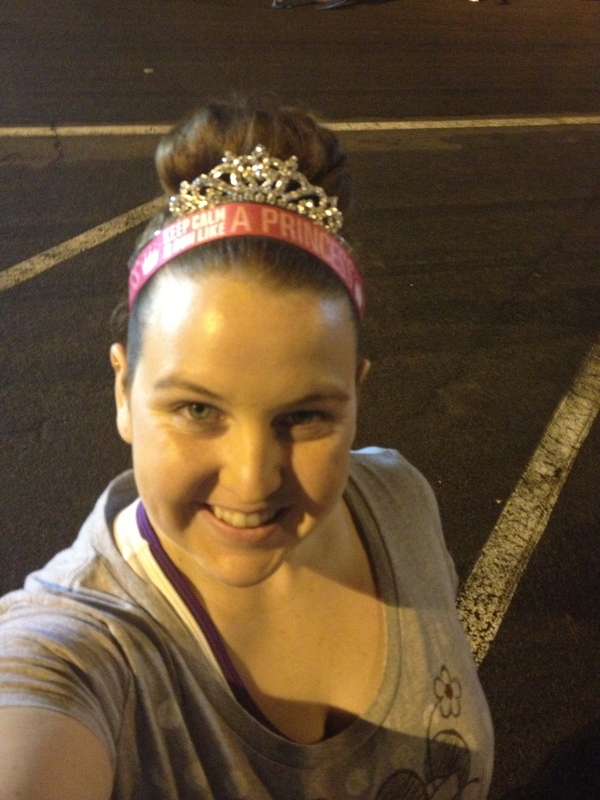 My experience with Happy 5K allowed me to prove myself that I could accomplish having a social life (because 90% of the time I’m kind of caught up in doing my own thing) and still stay active (because when I do have a social life I usually let my workouts take the hit and fall by the wayside). It allowed me to clear my head and cleanse my system from the night before. It encouraged me to push myself when I normally would have made excuses to stay in and laze around. And on top of that I got to participate in something awesome that I’d never heard of before – a virtual 5K – and to help support a good cause! And guess what came in the mail today! 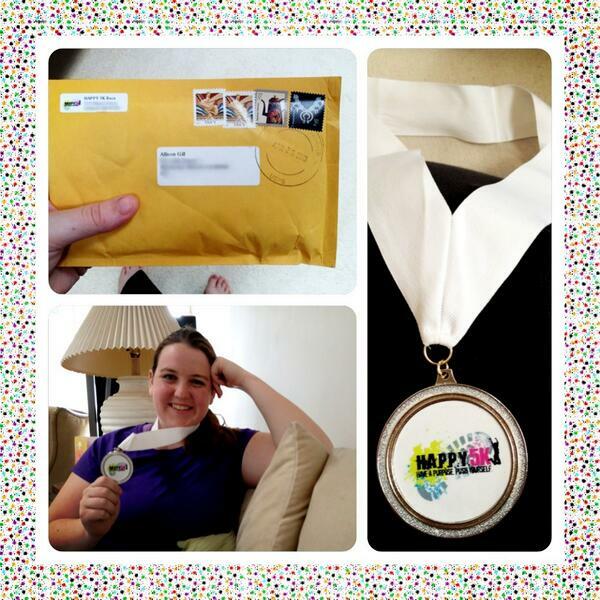 My medal! Probably my favorite so far! 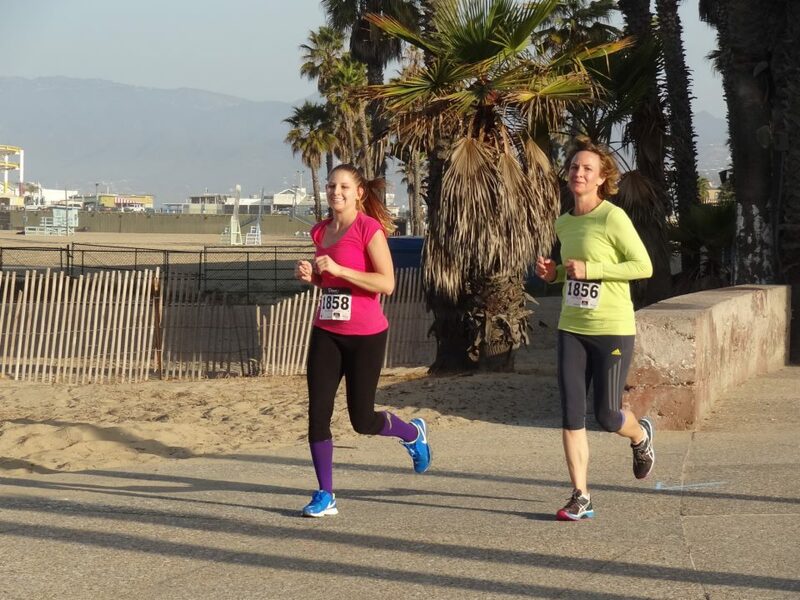 Interested in reading up on the Happy 5K? Check out the website! 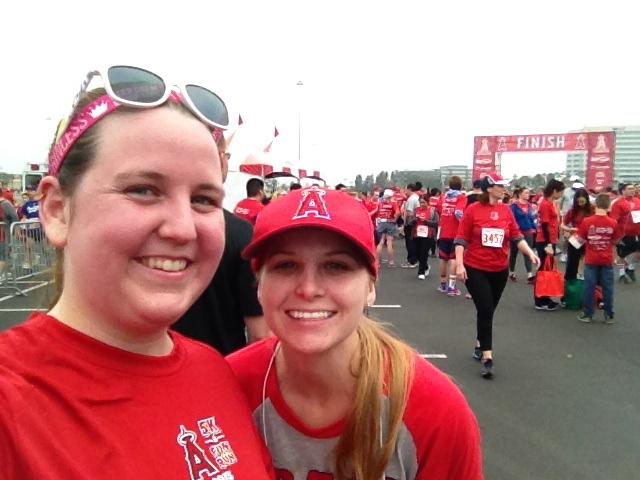 Race Recap: Anaheim Angels 5K! Yep! 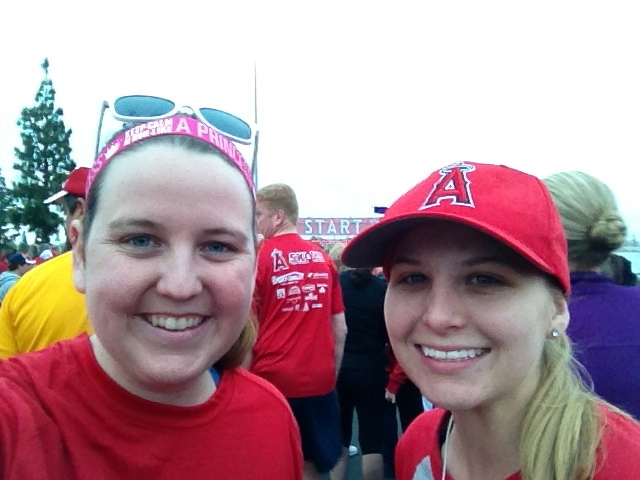 This 5K took place at Angel Stadium! 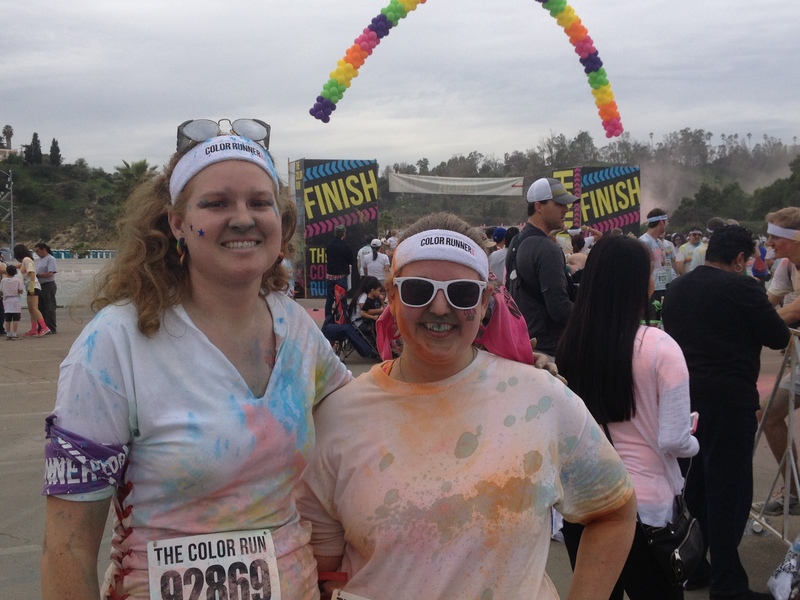 My third 5K of 2013 was a doozy! In fact, it almost didn’t happen at all. Because of traveling and health complications in the family, I got a little sidetracked from my health and fitness goals, and almost let my race-a-month resolution fall by the wayside. 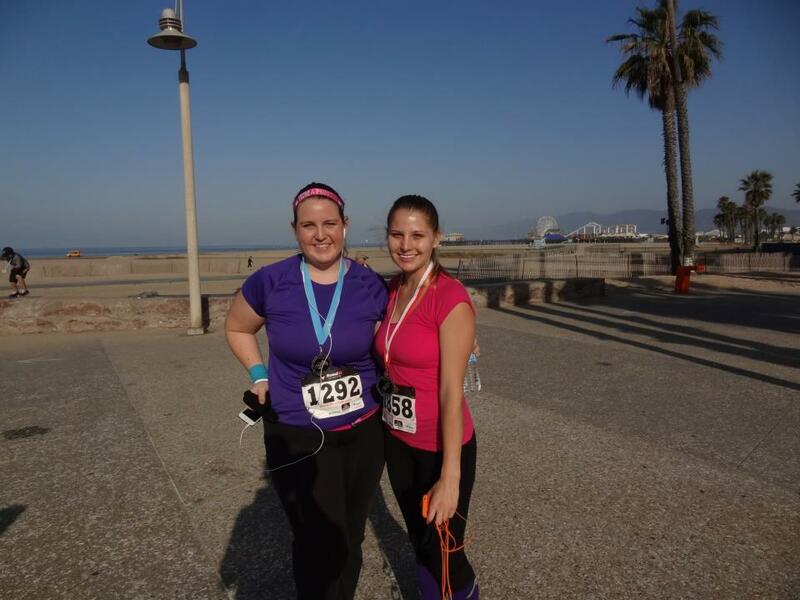 Luckily for me, I had a friend who wanted to do the races with me, who I certainly wasn’t going to let down! I had told her about my resolution before my first 5K, and she was eager to join me in my quest! We’d originally mapped out potential races for March, and on a whim I dropped her a text to see if she was still interested earlier in the month. She jumped right on board and texted me repeatedly to remind me/follow up on our status with the races. 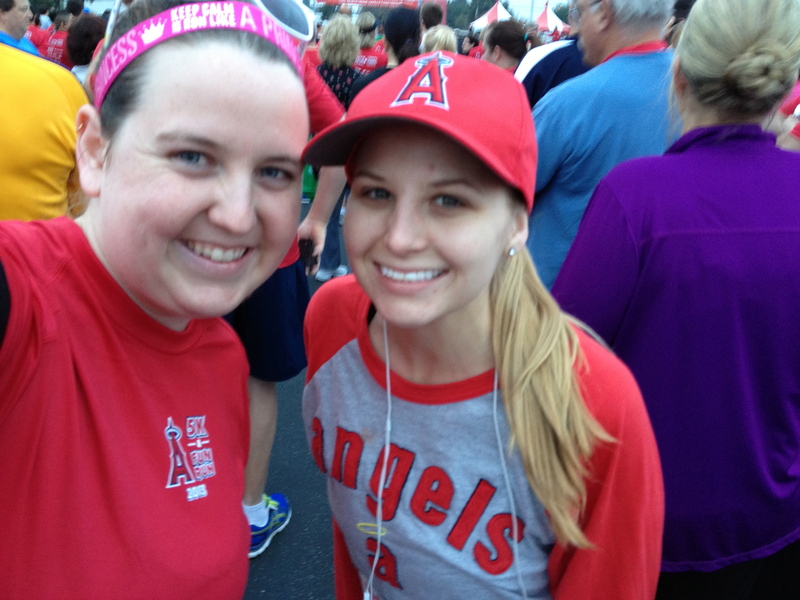 Which is how I ended up at the Anaheim Angels 5K on March 30, 2013. Unfortunately, because so much of it was planned at the last minute, I ended up not only not getting that day off of work, but closing the night before! Which of course meant I wasn’t off until 11:30 pm. Thankfully, my friend let me crash on her couch, so I wouldn’t have to drive down the morning of, but that still meant getting to Anaheim around 12:15 am! On top of this, we had to wake up early to pick up our bibs at registration because we couldn’t make it the day before; and my friend had to work at 10 am the morning of! Nevertheless, we got ourselves out of bed, practically inhaled some peanut buttered toast and water, and were off to the race! 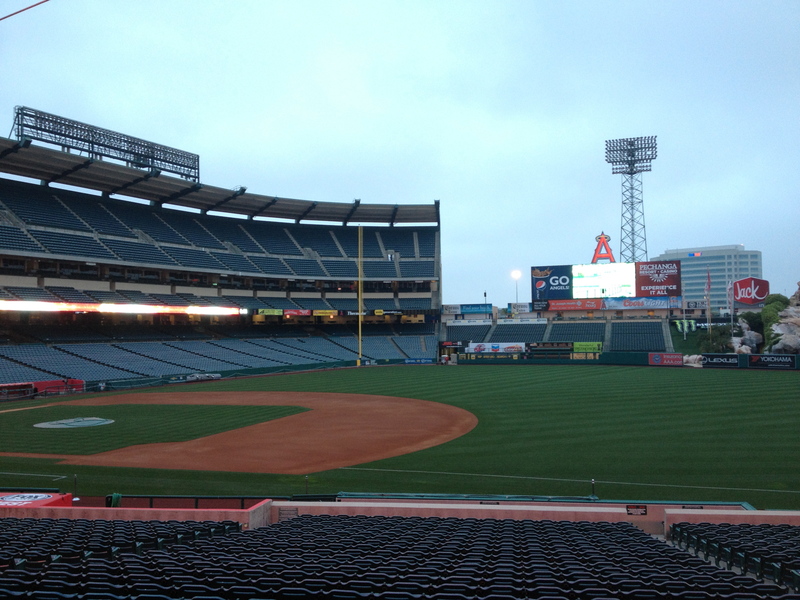 We ended up getting there early which meant we had plenty of time to get ourselves set up, hit the bathrooms, and check out the awesome view of the empty stadium! 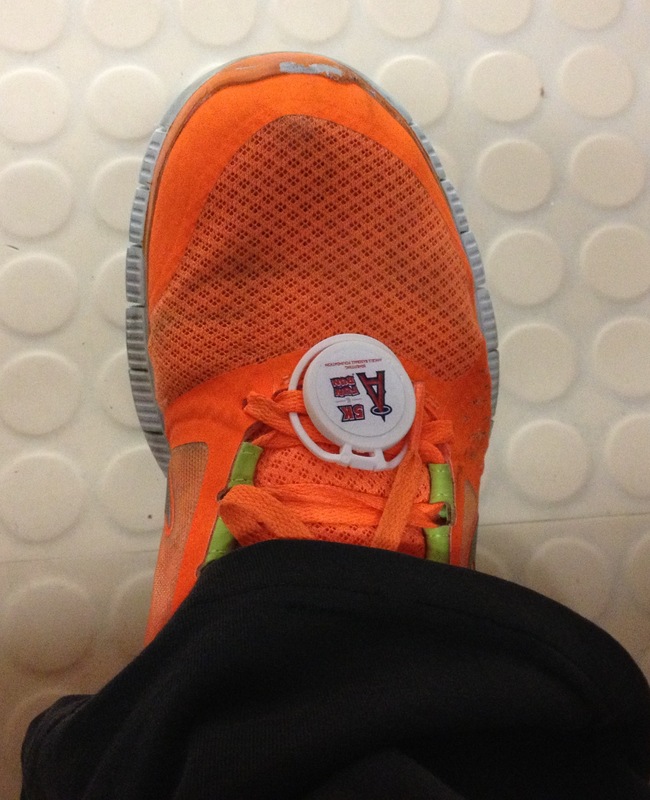 Unfortunately for me, I couldn’t find any merch to buy; so if I want to keep up my goal of wearing something from each race at each of my races, I’ll have to just leave the nifty little shoe tag they gave us to track our times with on my shoe! Kind of neat, right? Has the logo and everything! Finally, we lined up at the starting line, listened to the National Anthem (though I was a little embarrassed – I couldn’t find the flag anywhere), and heard a little mini-speech about what a great job their team was going to do this year. Can you see the banner? 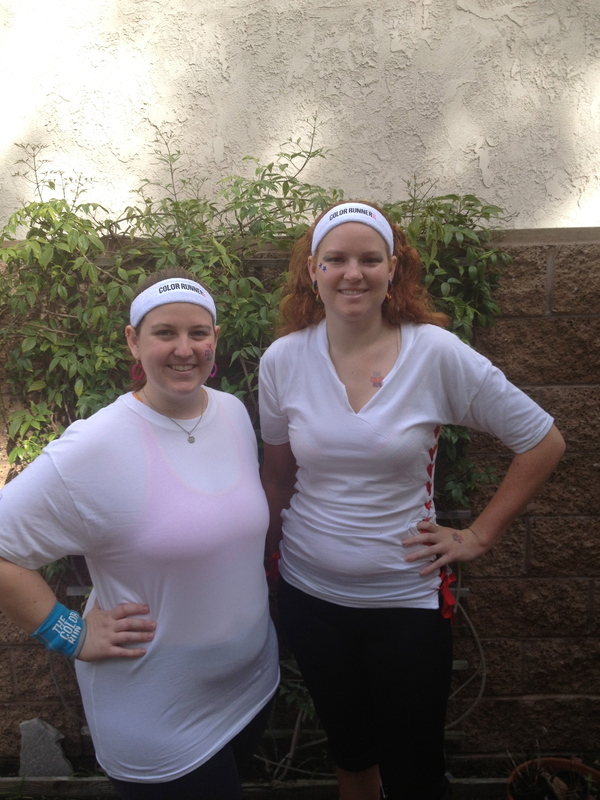 We had just enough time to put our headphones in, set up our run-tracking apps for timing ourselves, and get going! We agreed to run separately and meet up at the finish line, since she’s a much more experienced runner than I am and has very different goals. Running the entire race alone was a new experience for me, and I had very mixed feelings about it. On the one hand, I was able to listen to my music without feeling like I was being rude, which meant I could amp myself up to my power songs and push myself that way. On the other, I was lacking the distraction of having another person running next to me, and the race ended up feeling a lot like my usual solo runs. 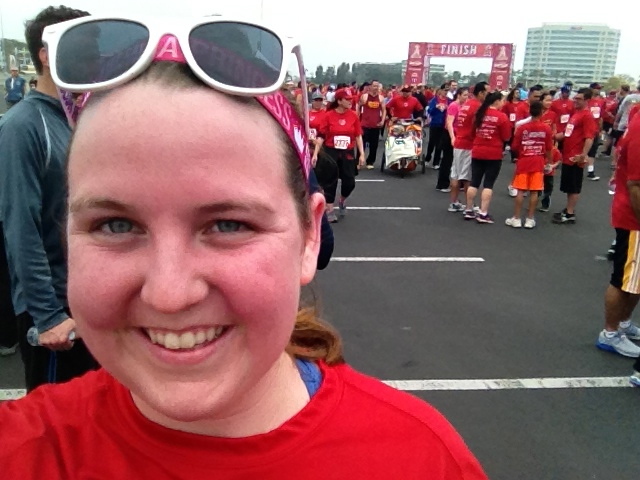 Because I’d taken a hiatus from running, I didn’t have particularly high expectations for myself. After signing up for the race I did a few test runs; my first went abominably and I ended up having to walk almost the whole thing, and my second went alright but I still ended up at a 14:24 mins/mile pace. My goal for the race was to come in under a 14 min/mile average. I was pretty confident that I was coming in close to my goal time as I reached the final stretch of the race: the leg that took us through the actual stadium. We entered the field and traveled from First to Home, and then back out toward Third. This is where the bottleneck happened. Because the race was full of Angels fans, everyone wanted to stop and take pictures of themselves and their kids on the field and in the dugout. I started to worry that the congestion was going to cost me my goal, and kicked it into high gear for the last tiny piece before the finish line! Look! My face matches my shirt! I made a beeline to where they were handing out water bottles and then looped back to find my friend and compare our times. Woo! Look at this pair of winners! It turned out that she’d smashed her goal! She was shooting for around 9-10 mins/mile and came in under 8! But then came the dreaded question: How did I do? Wahoo! Better than I’d hoped! I was thrilled to see that not only had I come in under a 14 min/mile like I’d wanted to, I’d made it under a 13 min/mile! We were both incredibly pleased with our success! We stopped at a tent to grab some awesome reusable bags, some cute baseball themed pens, and some food before high-tailing it back to her house so she could shower and get ready for work before dropping me off at my car. 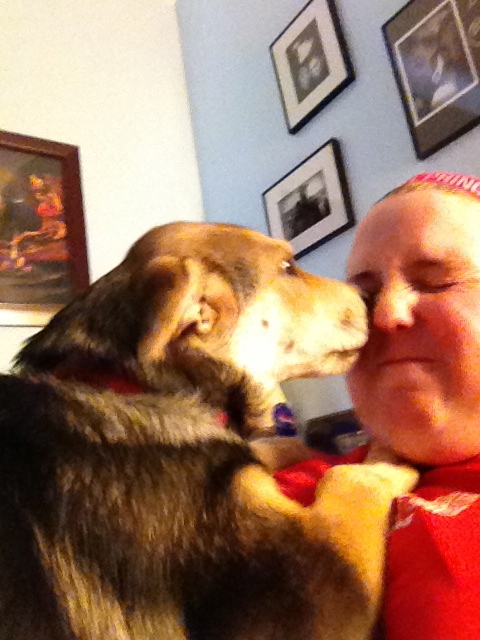 Which meant I got to spend some quality time with her adorable puppy! All in all, a great race! Even with all of the craziness. 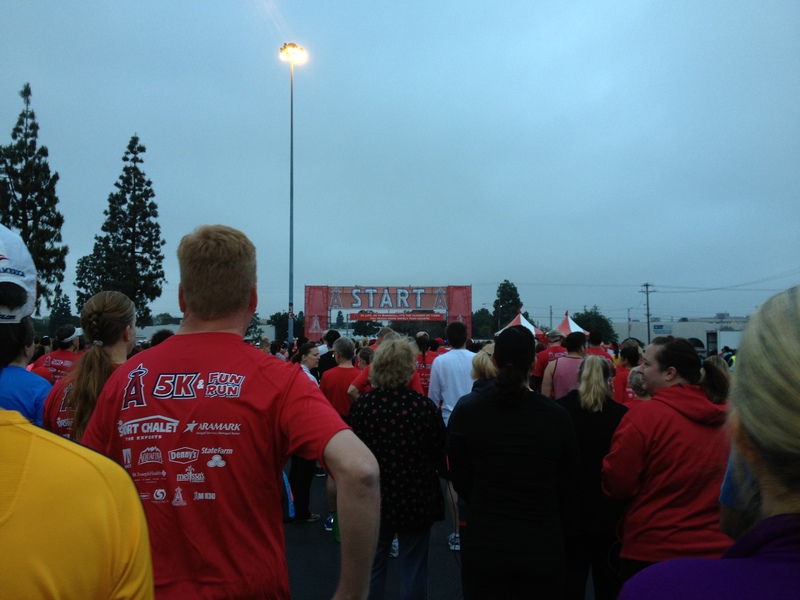 Interested in learning more about the Anaheim Angels 5k? Check out their website! 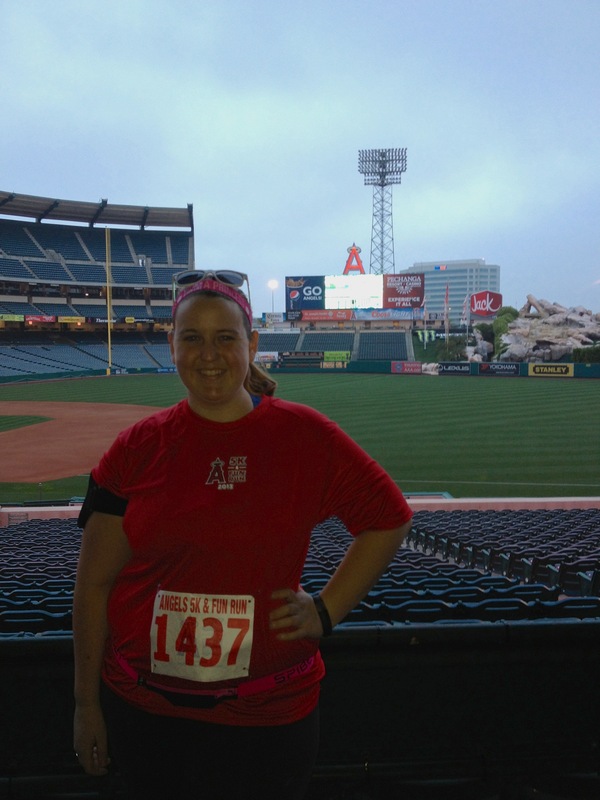 Fun Fact: 2/3 of my races so far this year have taken place at baseball stadiums! 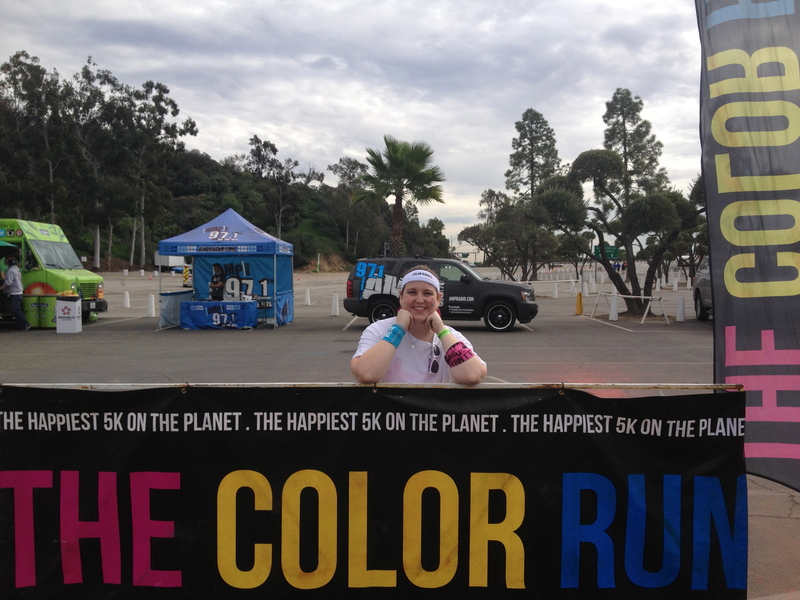 The Color Run – Los Angeles took place at Dodgers Stadium! 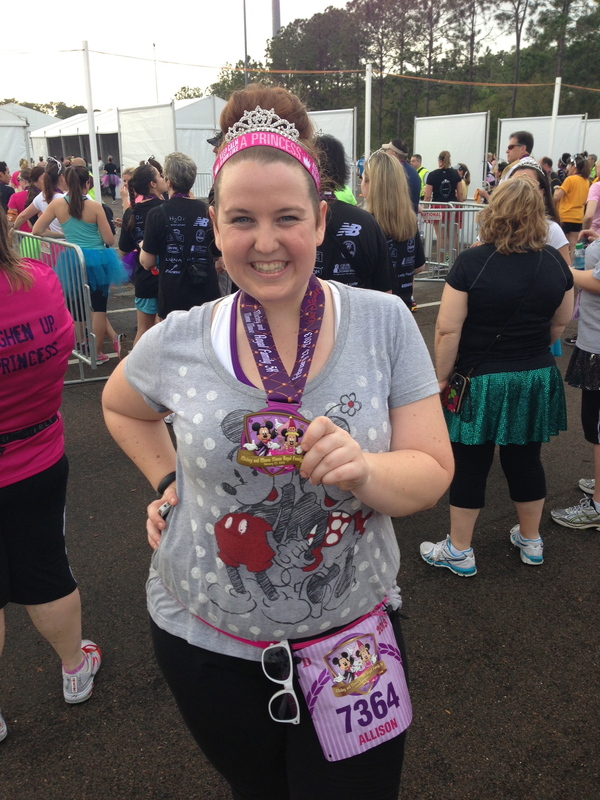 Race Recap: The Mickey and Minnie Royal Family 5K! Yep, definitely went insta-collage crazy on this one! 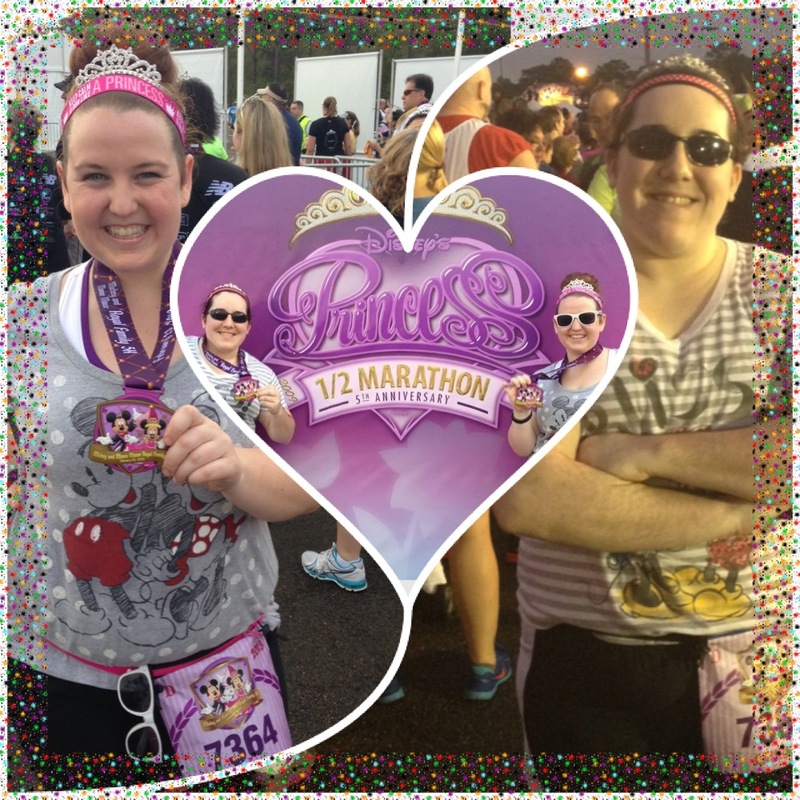 My second 5K was the Mickey and Minnie Royal Family 5K on February 23,2013; part of the Princess Half Marathon Weekend at Walt Disney World! 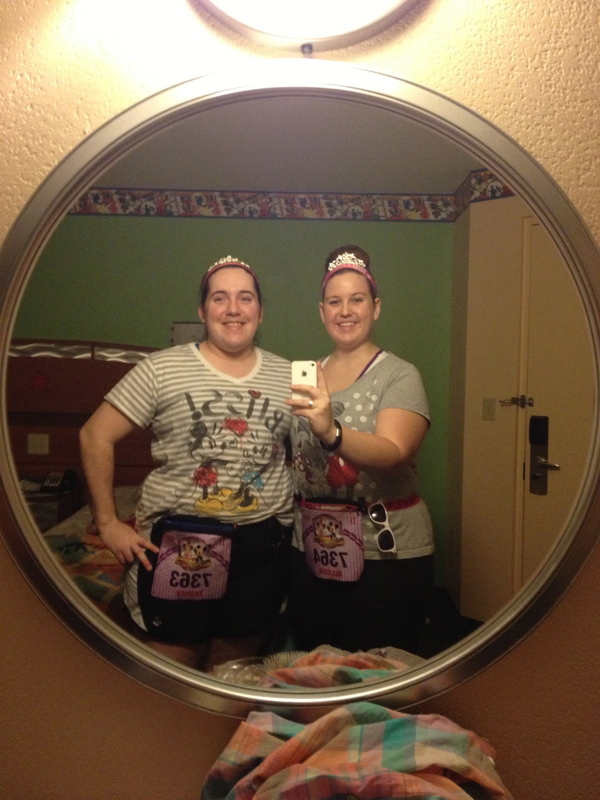 Not only was it an amazing race, it was also a great opportunity for my first trip to WDW! 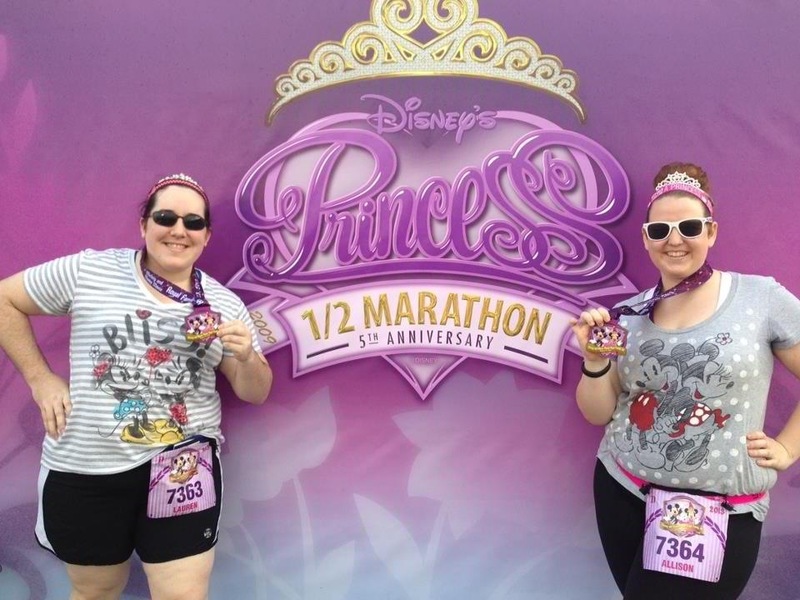 This race was probably hands down my favorite, because on top of not getting as bogged down at each kilometer mark with color throws (like I did at the Color Run), we got cute little medals, there was an expo, and we got to run through Epcot! 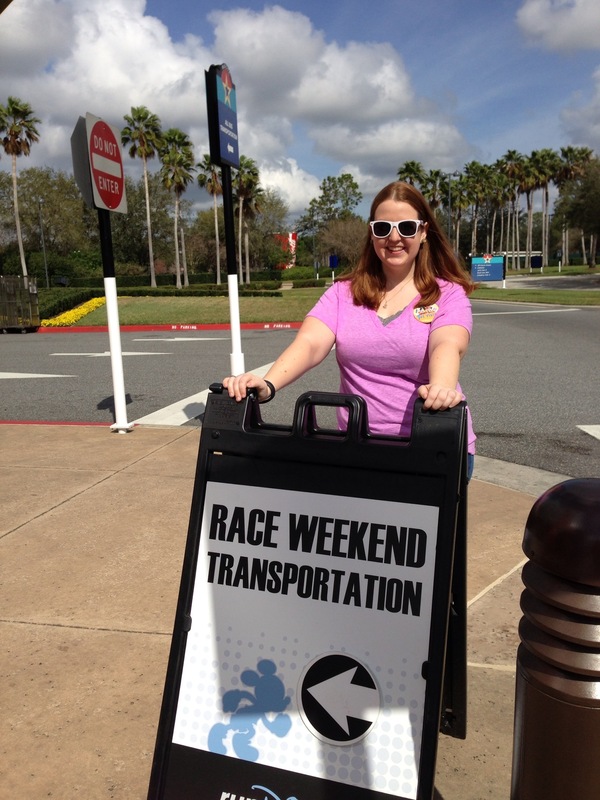 Because we stayed at one of the Walt Disney World resorts, we got to take advantage of the free transportation both to and from the expo and the race! Waiting for the charter bus to take us to the Expo! 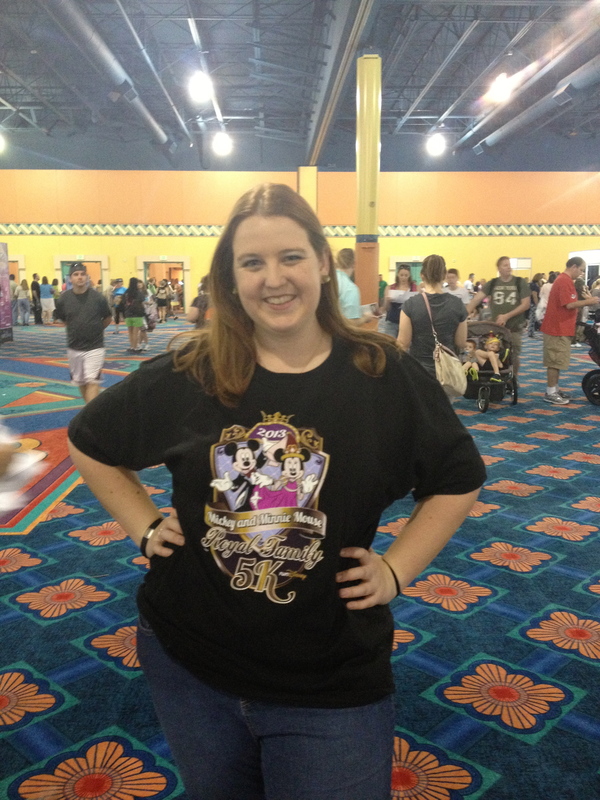 When we got inside I was awestruck at how big the building was and pumped to pick up our numbers and shirts! Giant expo – giant sign! How cute is this bib?! It even has my name on it! I figured I’d go with an XL to be safe, but it turned out to be huge! On the other side of the registration kiosks there were all kinds of merchandise tables, selling SPIbelts (of which we each got one), running shoes, insoles, gel packs, t-shirts, official merchandise, Sweaty Bands (of which I got two), themed skirts, headphones, and more! 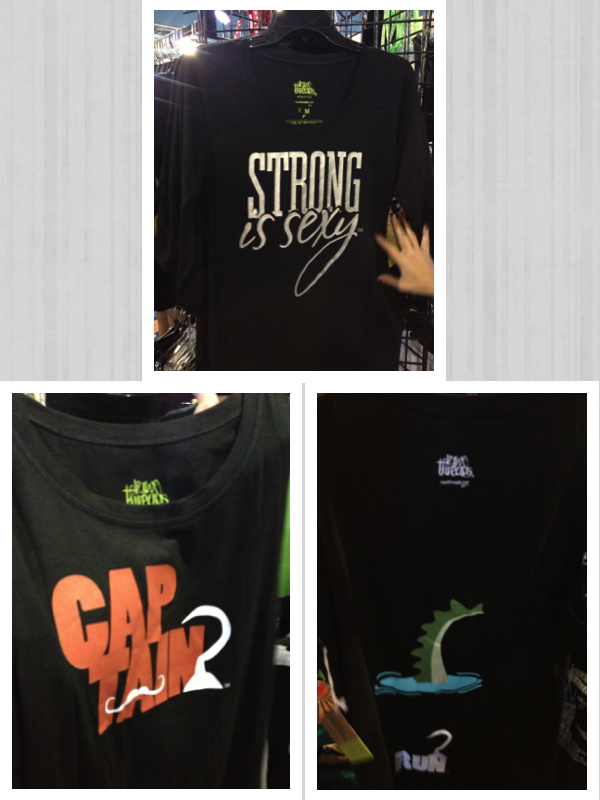 I was particularly into the RawThreads villain t-shirts! I bought the Ursula one. Luna Bars also had a stand there, where they were providing signs to decorate for the spectators on race day! I decided to make one anyway, even though I couldn’t really use it. 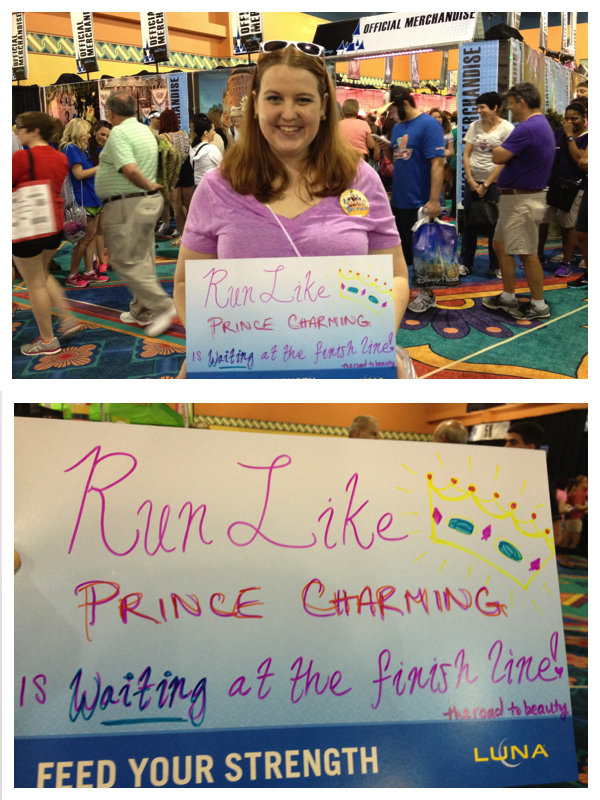 Run like Prince Charming is waiting at the finish line! After the expo we went to take a pre-emptive look at Epcot so that the next day when we were running through it I wouldn’t want to stop and look at everything because it was new and exciting. Obligatory pre-race selfie at the corral. We were in the slowest corral, which kind of turned out to be a mistake, since there was a lot of bottlenecking and walking – which kind of impeded our progress. But, the goal was to run the minimum speed requirement – 16:00 mins/mile, and I’m happy to report that we came in at 15:50 mins/mile, even with the scenery and getting bogged down with congestion! I had a goofy smile on my face the entire time. I just couldn’t stop grinning! Spaceship Earth in the background! Woo! 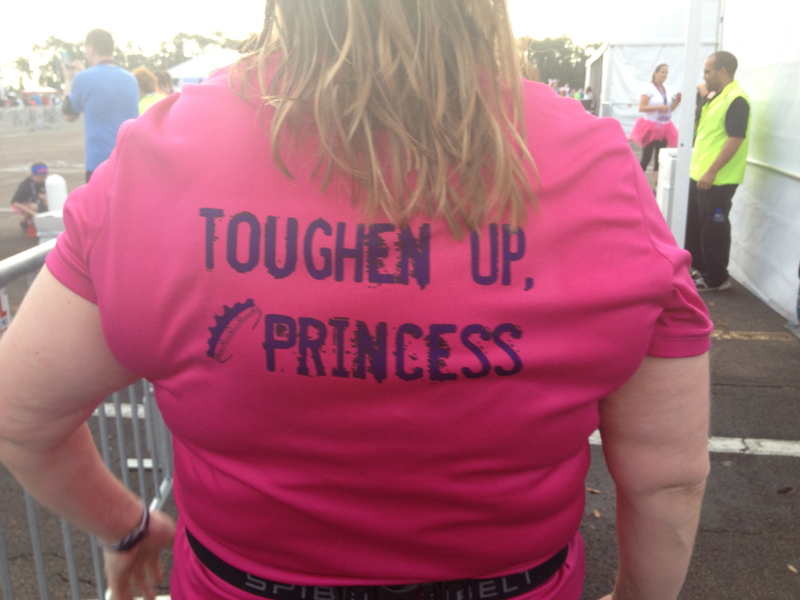 When we got in line to take our pictures after the race, we ended up behind a woman whose shirt had kept me going throughout the race! Seriously, how great is this shirt? Photo time! Posing with our medals! 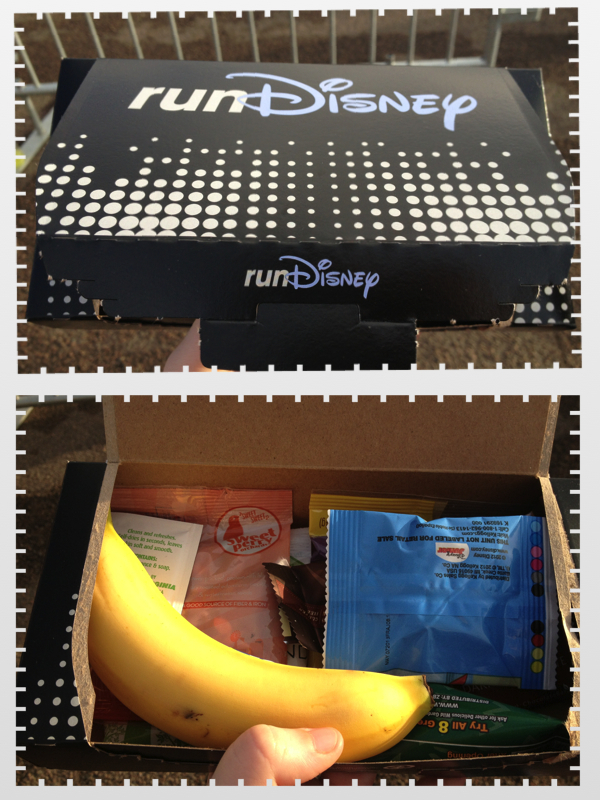 After we got our medals and took our pictures, we stopped by the tent where they were handing out post-race snack boxes! On our way out of the photography area, we passed the medal racks and I snapped this pic to give an idea of how many people finished before us. 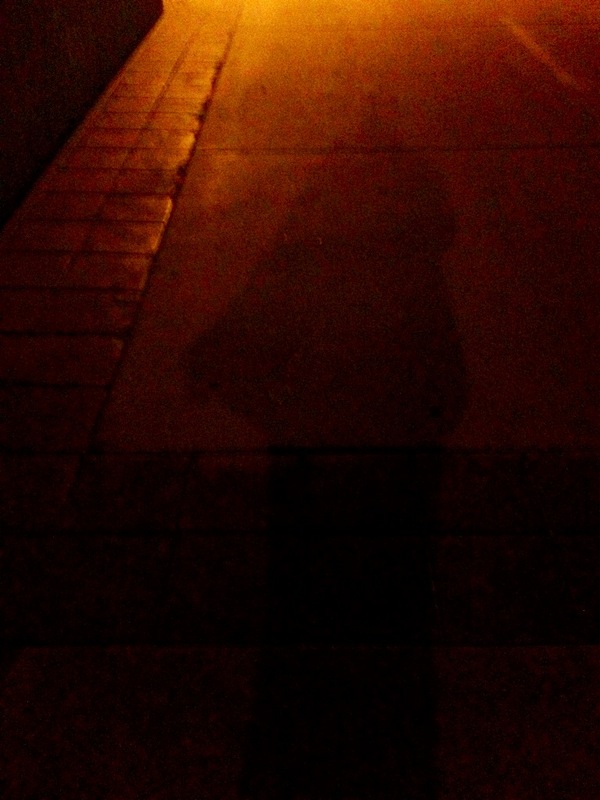 Plus I thought it kind of looked cool. I took another shot with my medal for posterity! 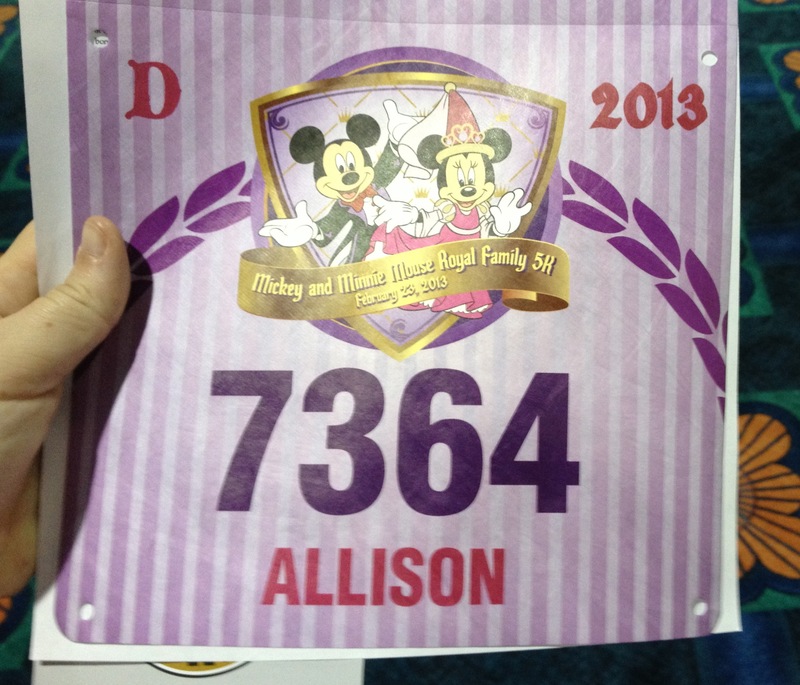 If you’ve never done a Disney race before and can afford one, I can’t even begin to say how highly I recommend it! 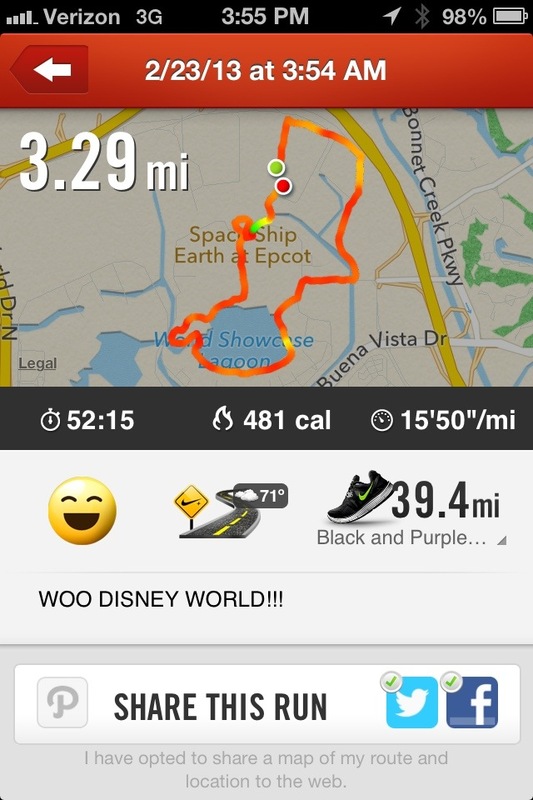 What could be better than a great run through the happiest place on Earth? 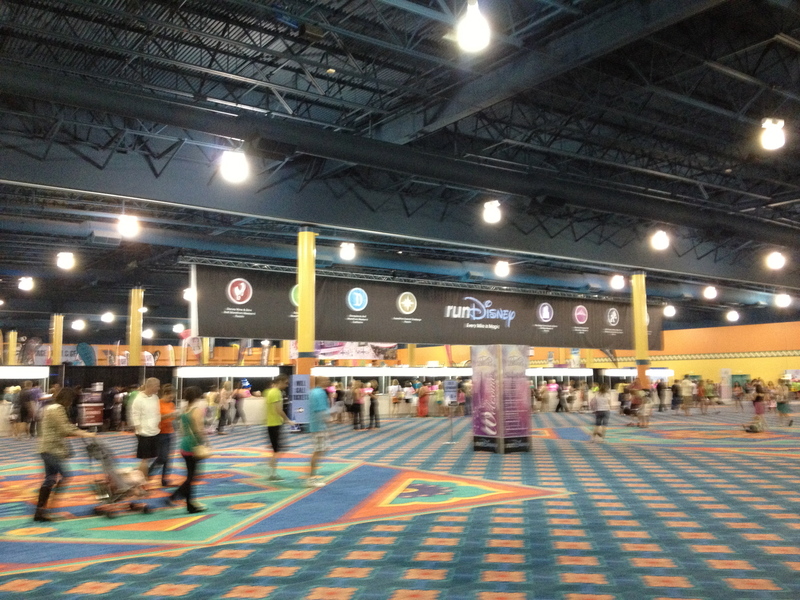 I’m definitely putting one of the half marathons on my list for 2014! Who could resist a photo with the logo? 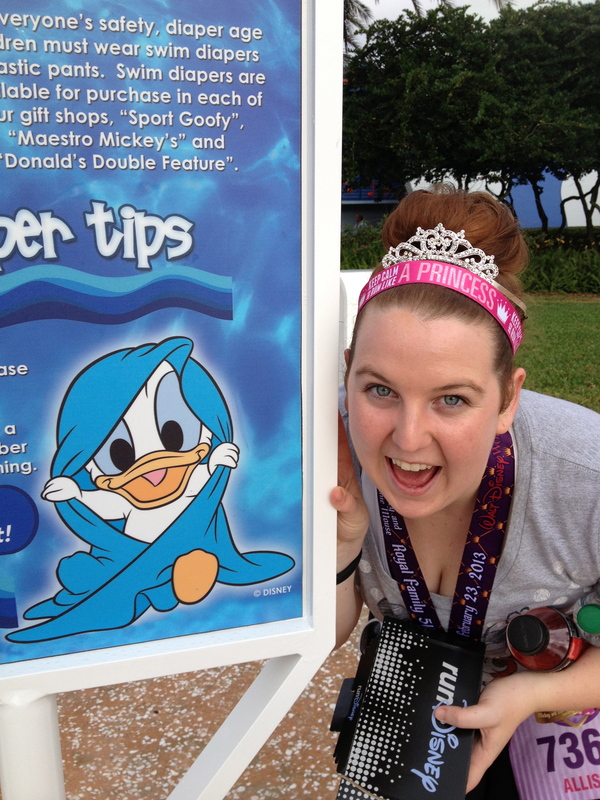 And a bonus post-race shot of me and my favorite Mickey and Friends member at the hotel pool! Can you tell he’s my favorite? 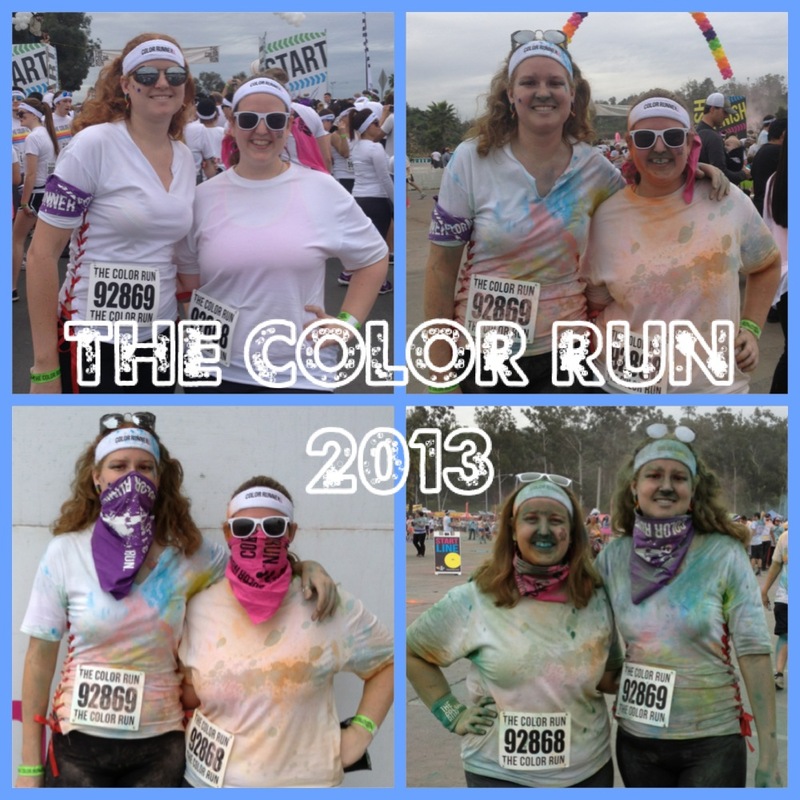 On February 2, 2013 I participated in my first 5K of 2013! 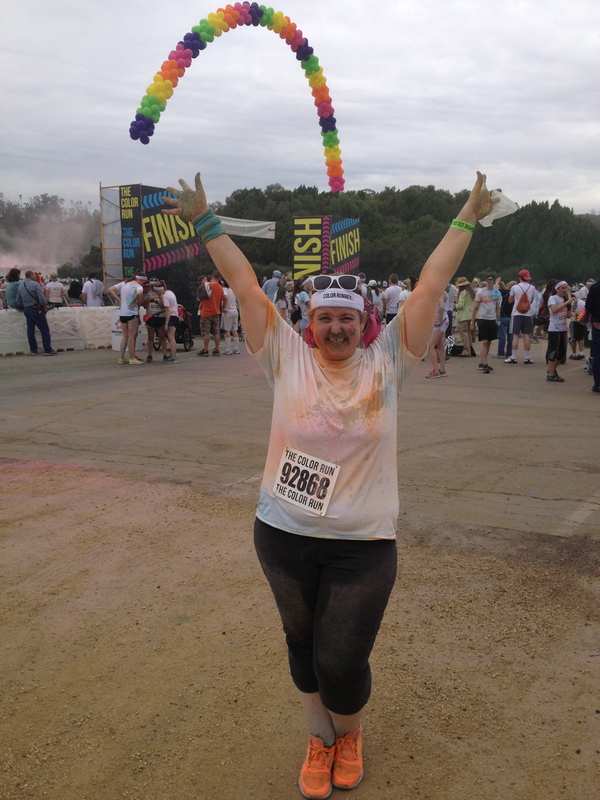 (And, let’s be honest here, my first 5K in years!) Long story short, it was a BLAST! 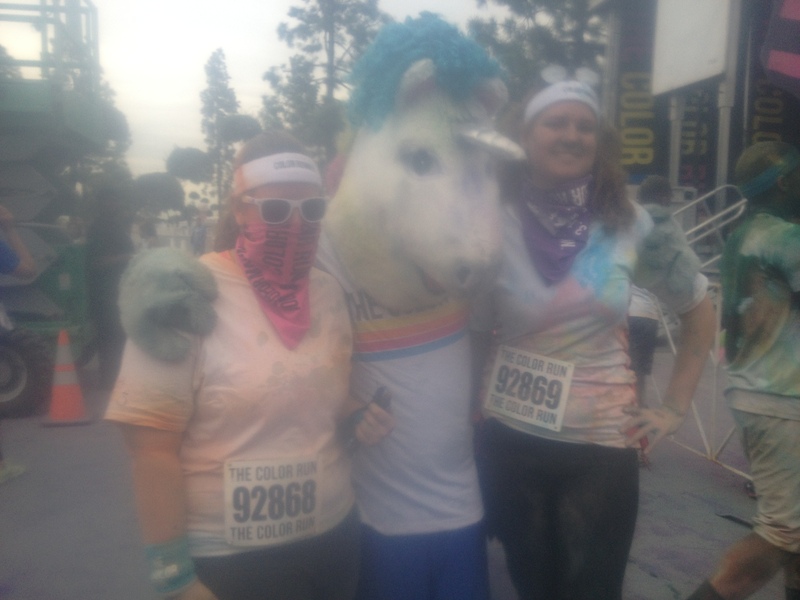 I can’t imagine a better first 5K experience. Un-timed, themed, and silly, this race took all of the pressure I’d been worried about with my first race off of my shoulders and hurled it into the air in a brightly colored mushroom cloud. The day before the race, I went to pick up registration for my friend and me, and also used that opportunity to pick up a little bit of merchandise for myself. I got this neat wrist cuff, called the Stuff Cuff. Which comes with a built in pocket to hold your money or your keys. The woman at the merchandise table tried to convince me it could hold your phone too, but I don’t really see that happening. At least not with my iPhone; I’m certainly not risking it. If you’re interested in buying one, they’re selling them online here. I also got a really cute pendant necklace that says Color Runner on it. Either of these will be awesome for my goal of wearing something from each race on my body at every consecutive race I do as part of my New Year’s resolution. Tip: if you’re going to be doing the Color Run, pick up your registration early and use that opportunity to buy color packets if you plan to. We got to our race (which, admittedly, was the second of the day) two hours early and they were completely sold out of them. Better safe than sorry, right? Before leaving on race day! We ended up leaving pretty early, and despite stopping for coffee and bagels (Yikes, bad idea alert! Even three hours in advance, those did not sit well!) we got there a full two hours early. Which meant that we had plenty of time for her to do my make up! Even my eyes are rainbow! We took lots of pictures to document this, because I knew it would be fun to have pictures to compare after the race was over! They had lots of cute/fun signs to pose with. We were worried it might start raining on us! Tip: remember to keep your mouth closed or actually use your bandana to cover your mouth! Second color throw! Orange! My favorite! Perfect opportunity for some REALLY flattering photos! Somewhere between orange and yellow is when my plastic bag started to get really covered in powder, so the pictures got kind of foggy. 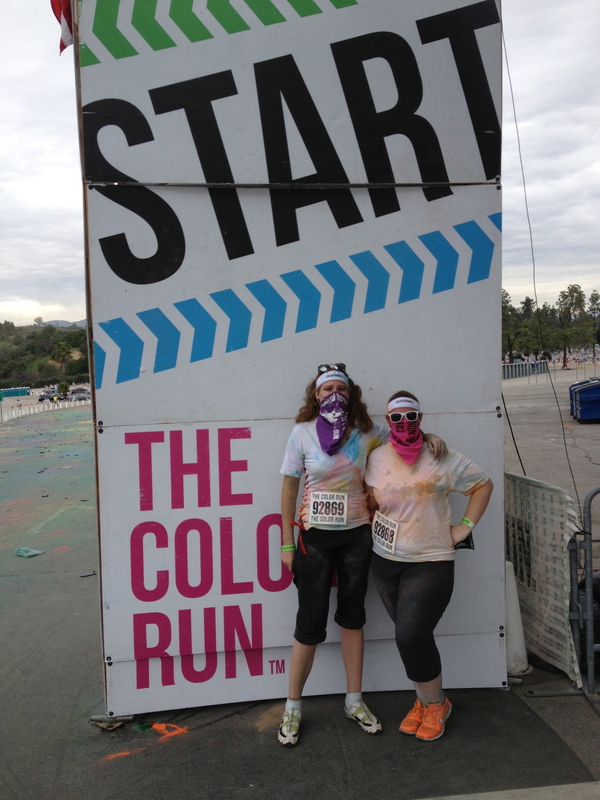 The final color throw was pink, but we decided to just wait and take a picture at the finish line. Woohoo! 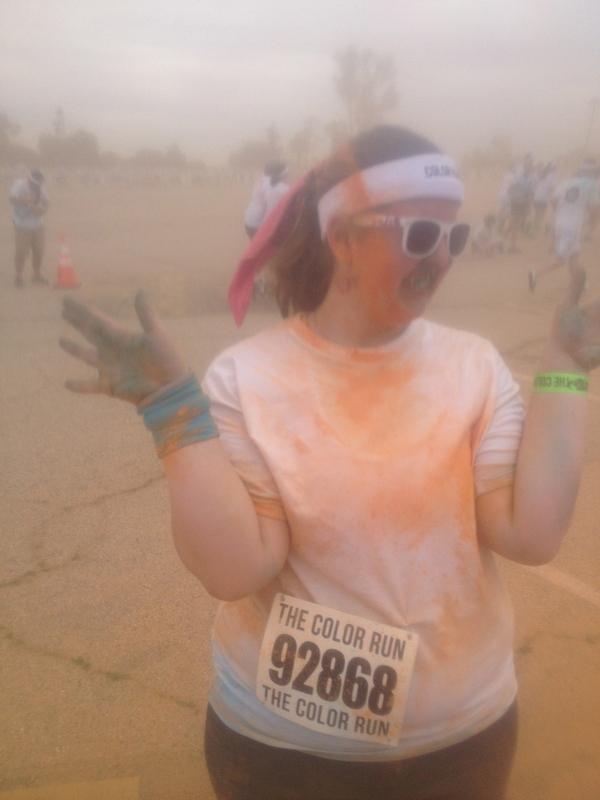 Officially a Color Runner! The final wave was just leaving as we finished up, which meant we were able to get in some post-race photos with the starting line before they took it all down! Way cooler than up close finish line pics if you ask me. Afterwards we spent about 20 minutes at the post-race party with intermittent color throws. It was fun, but I definitely wouldn’t attempt it without covering my eyes, nose, and mouth. That powder goes everywhere. One group of kids around us got crazy and started shaking up a soda bottle and spraying one another (and everyone around them) with it so that the colors would really soak in. Not so cool. 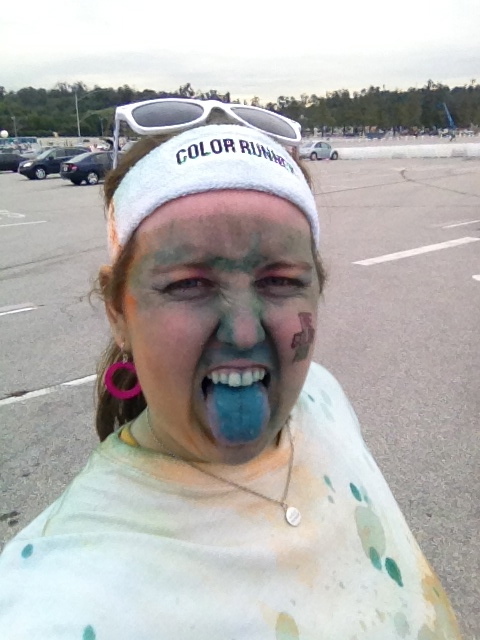 Remember how I said not to open your mouth when going through color throws? Before we left to get back in the car, we got dusted off with these giant leaf blowers they had set up. 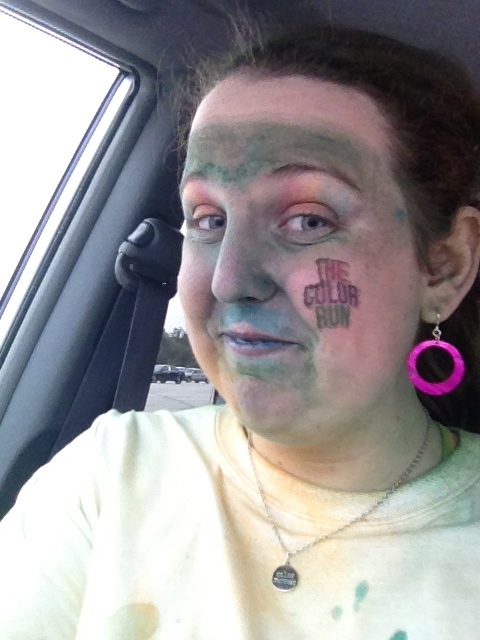 Lots of color came off, but not as much as I would have hoped. Definitely glad we brought towels for the car seats. Back in the car. Pristine headband line. 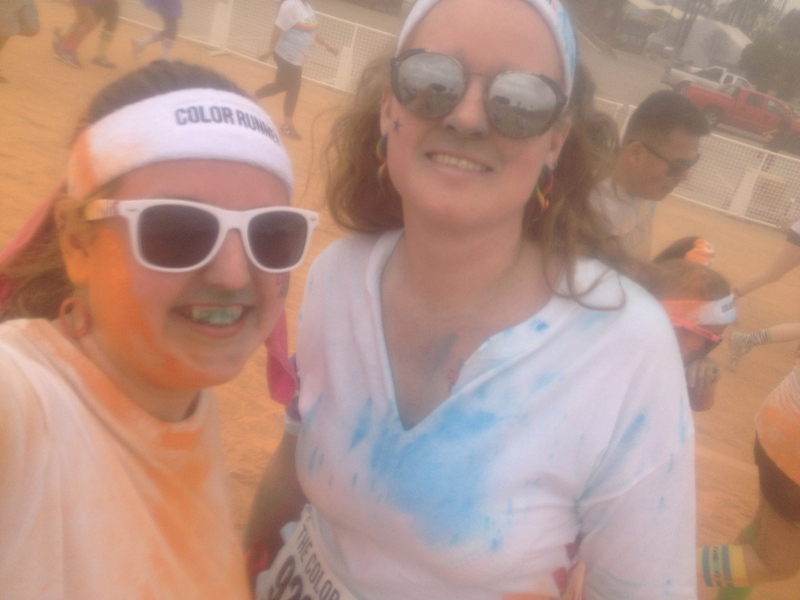 Oh yeah, and did I mention that because we were in the second race of the day, there was already a bunch of color accumulated on the ground where the color throws were happening? The blue went through the breathing holes in my Nikes and stained not only my socks, but my feet too! My feet were like this for almost a week! All in all it was a great experience! If I do it again next year I probably won’t bother with the post-race stuff. It’s the kind of thing that’s probably more fun if you like partying and are with a larger group of friends to mess around with. 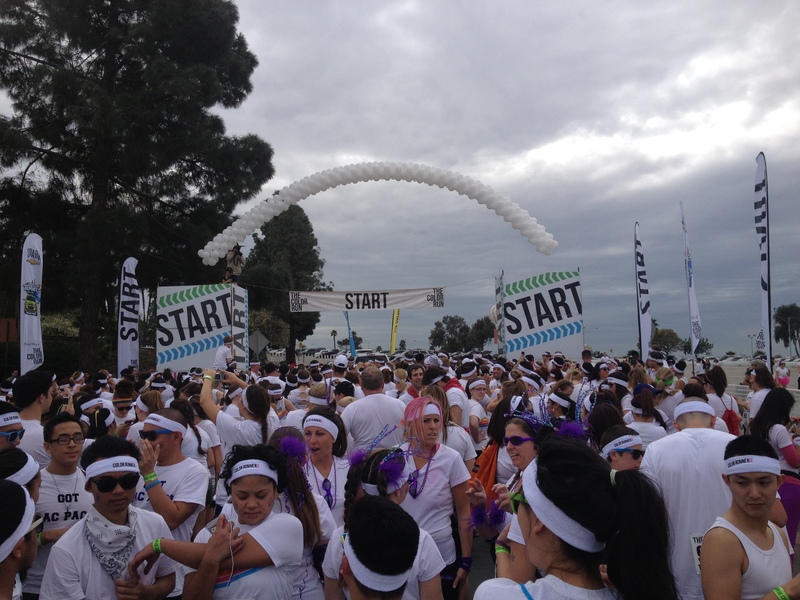 Interested in the Color Run? Check out their website! 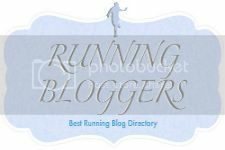 Enter your email address to follow All is Fitness and receive awesome notifications of new posts by email!